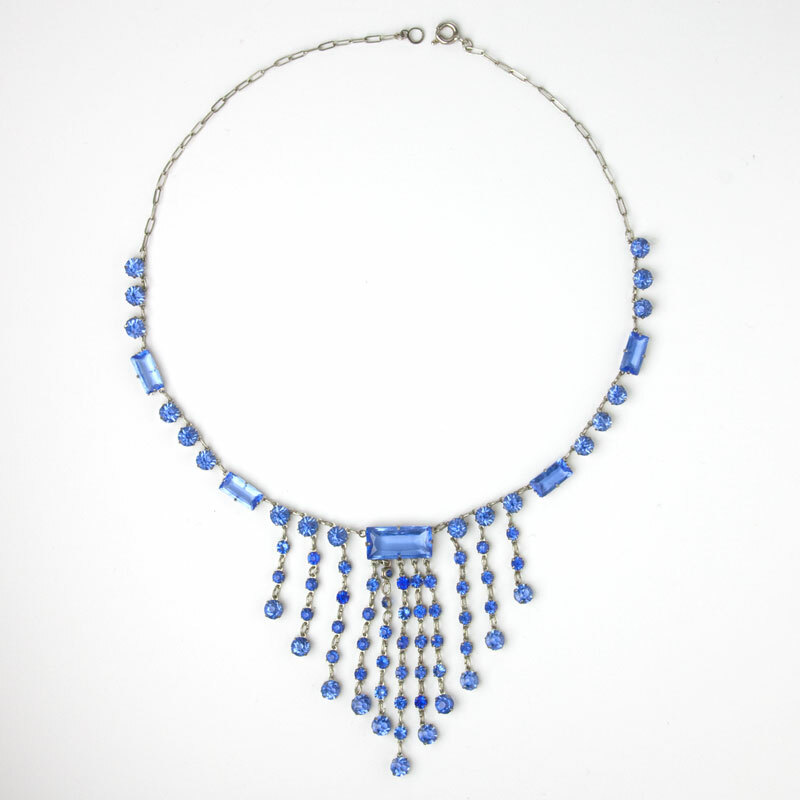 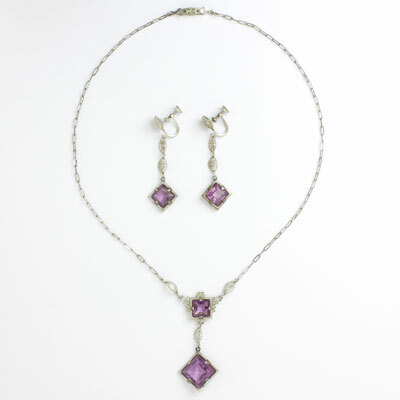 This unique selection of 1920s jewelry includes long earrings, long and short necklaces, narrow bracelets, and brooches. 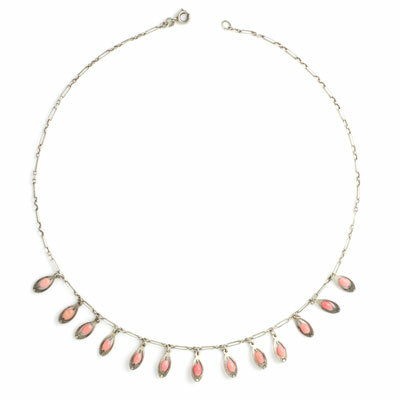 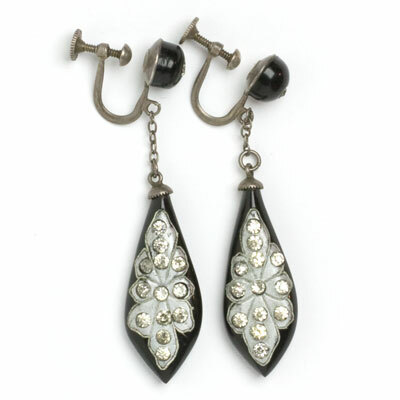 Originally designed for the flapper, these jewels are equally stylish today. 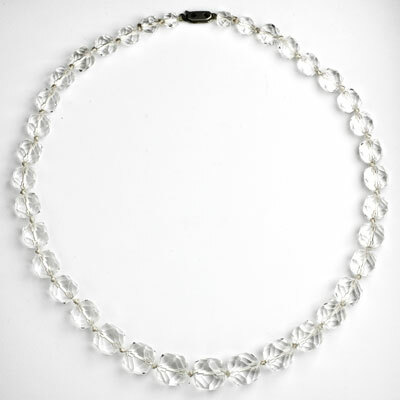 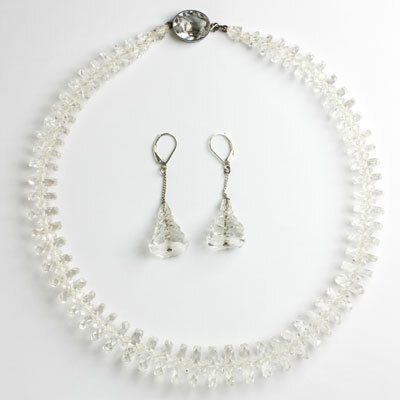 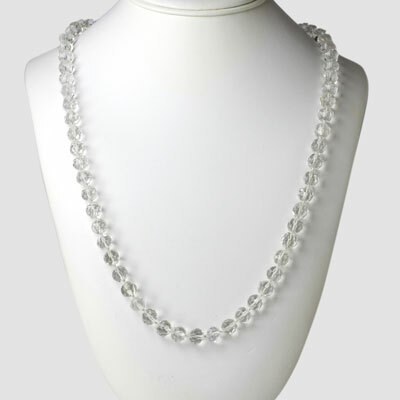 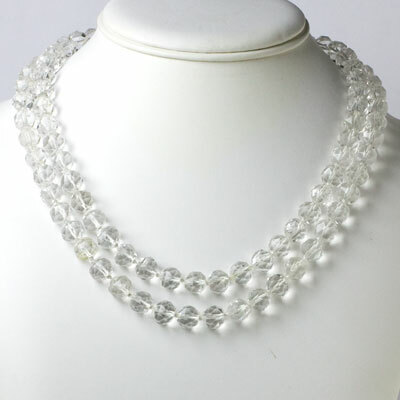 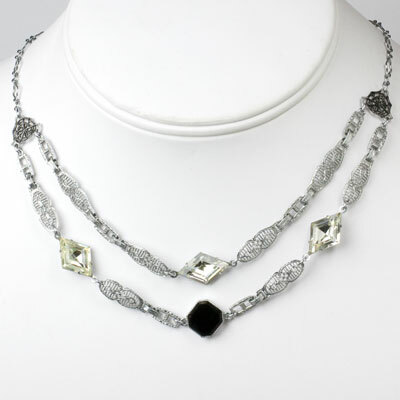 Many 1920s costume pieces were made from materials such as white metals, clear and colored glass stones and beads, faux pearls, diamanté, and marcasites, in imitation of fine jewelry. 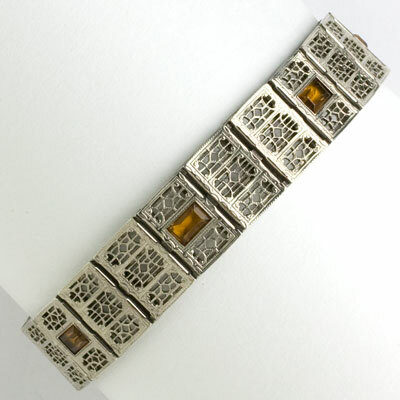 Filigree pieces in white and gilt metal were also popular. 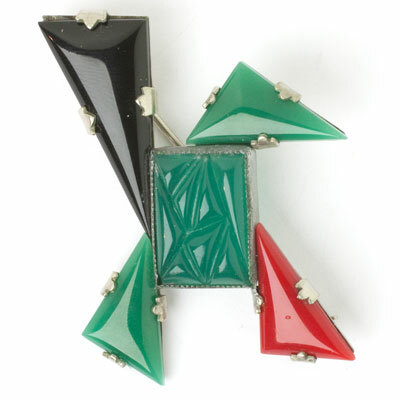 Colorful early plastics (Celluloid, Bakelite, and Galalith) were fashioned into novelty pieces at this time. 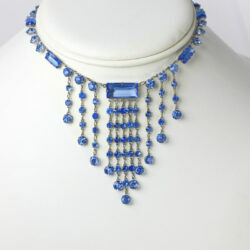 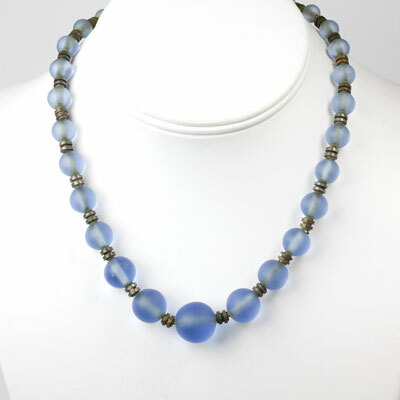 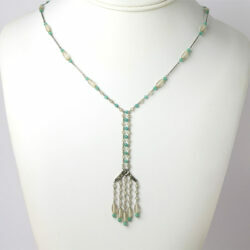 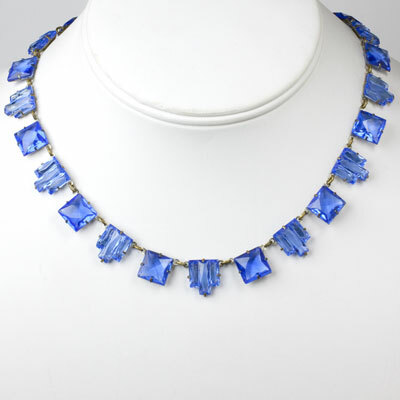 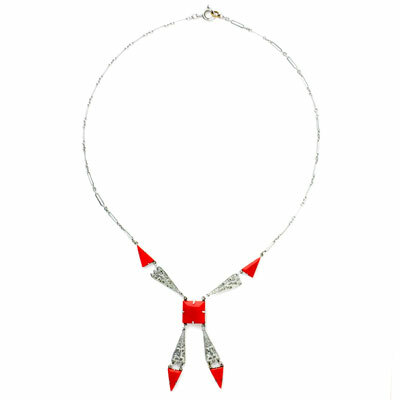 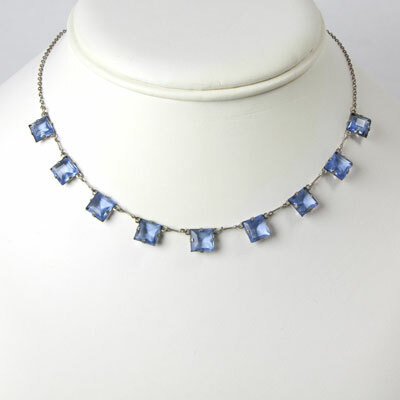 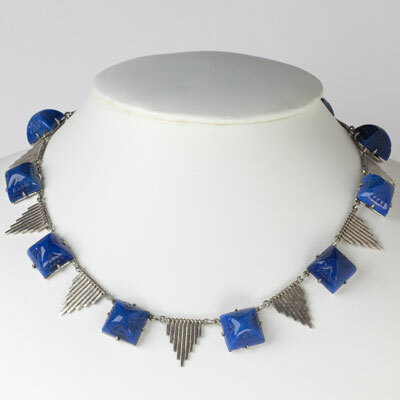 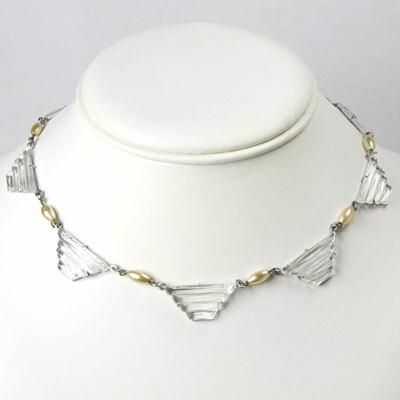 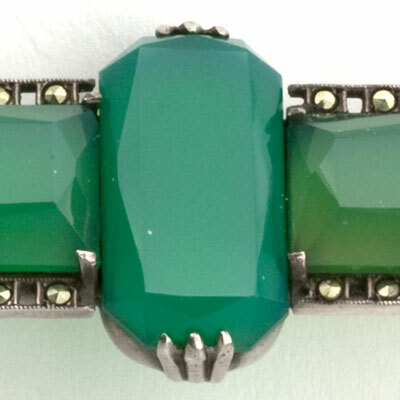 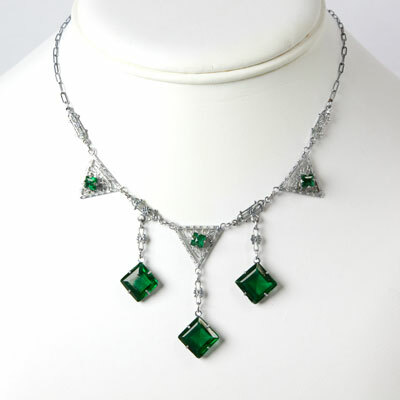 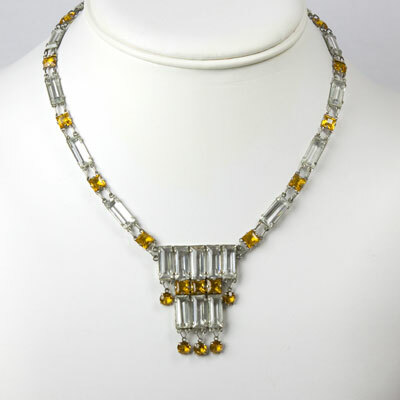 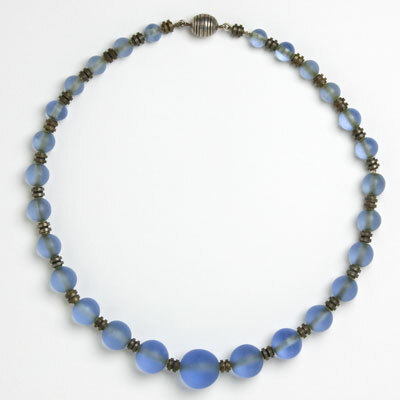 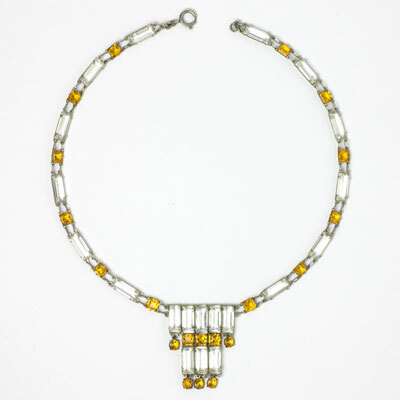 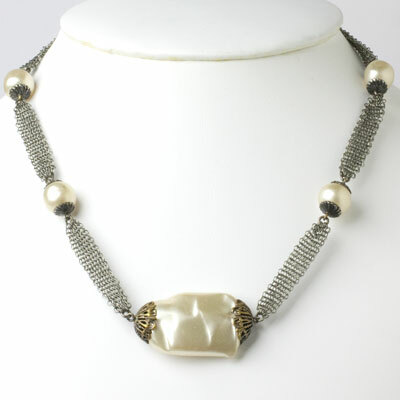 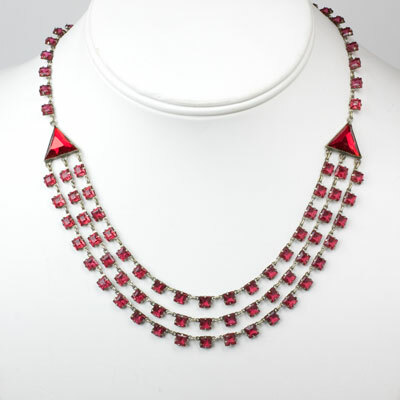 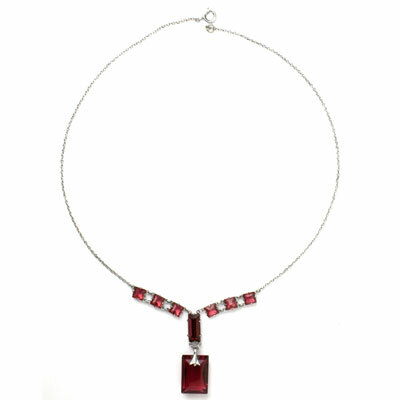 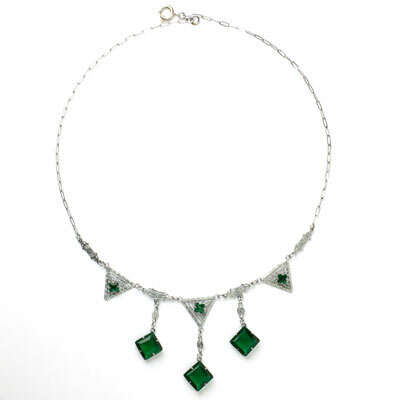 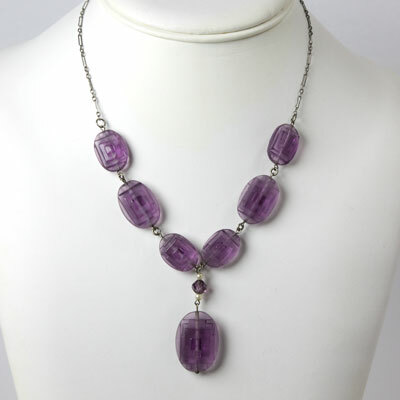 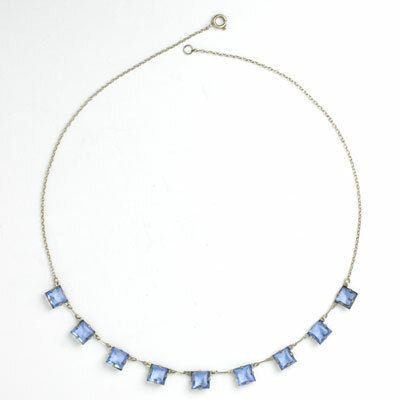 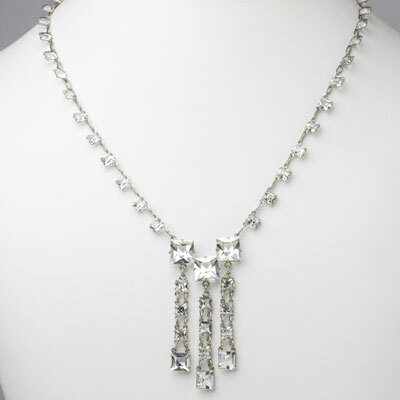 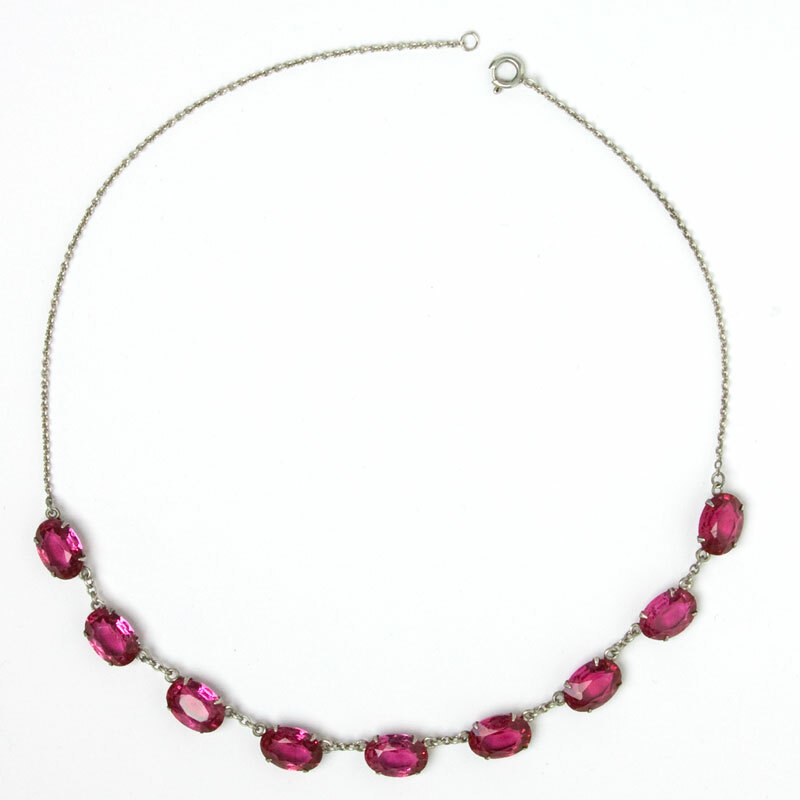 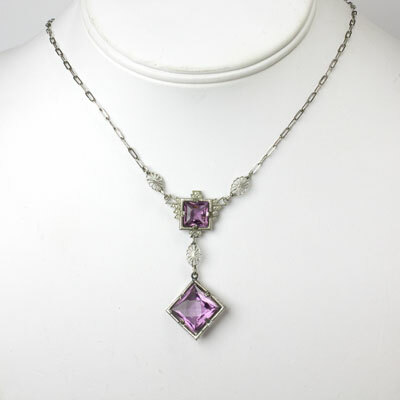 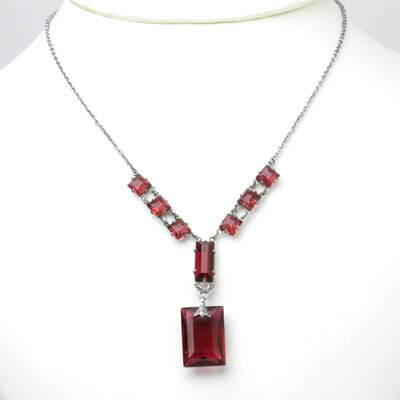 Jewelry in the Art Deco style made its debut in the 1920s. 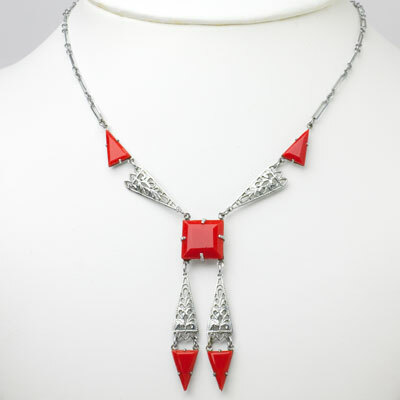 Read more about 1920s jewelry and fashion. 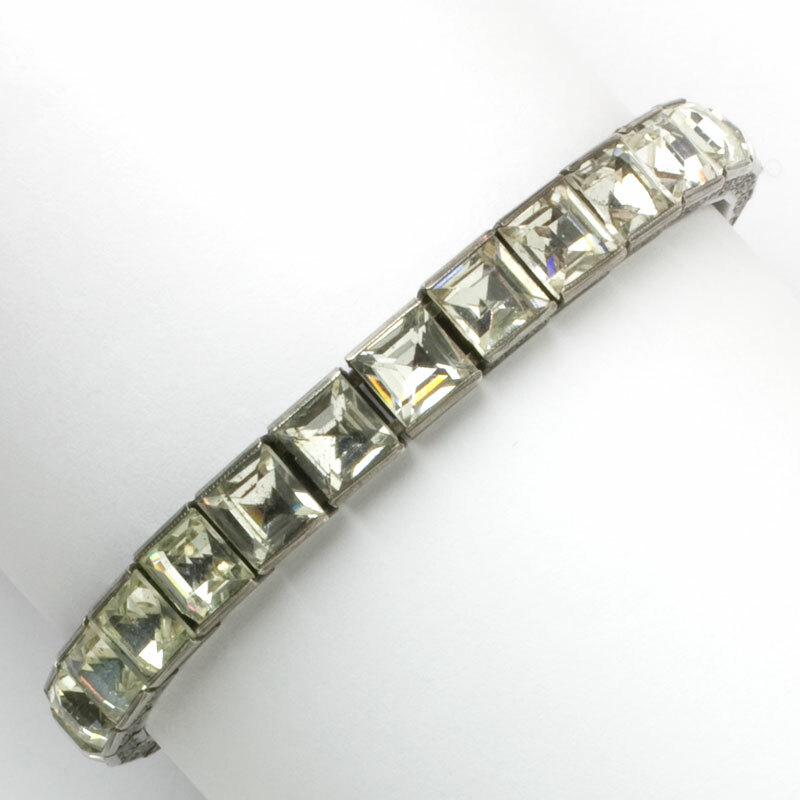 This crystal bangle bracelet by H. Payton is a style that was all the rage in the 1920s. 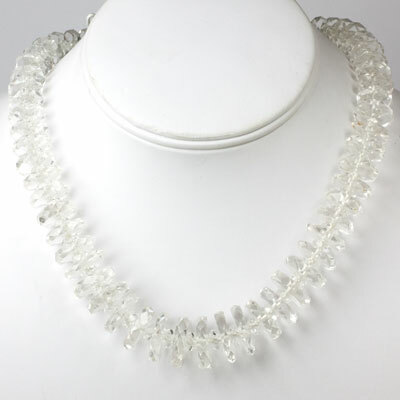 The company is best known by their PAYCO mark. 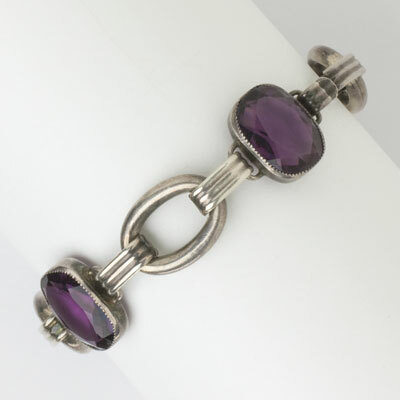 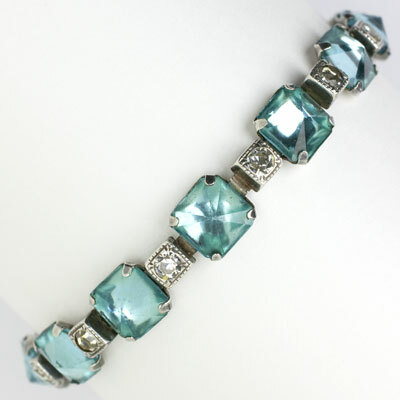 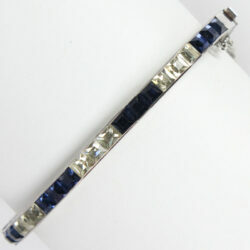 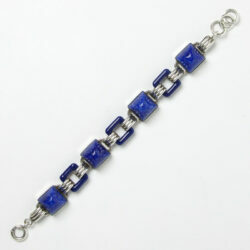 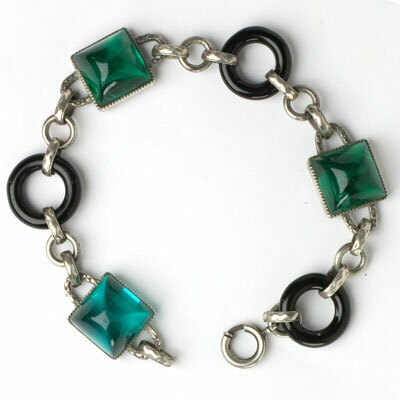 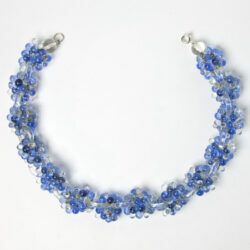 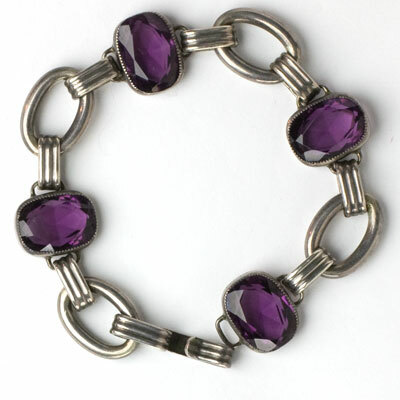 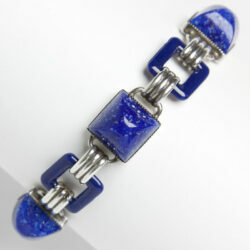 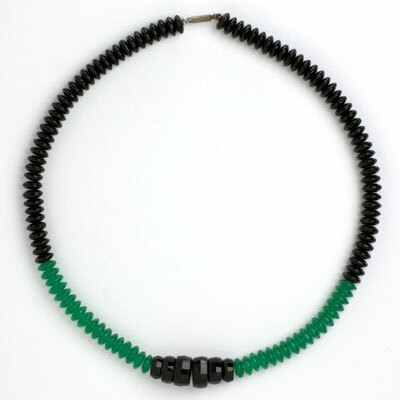 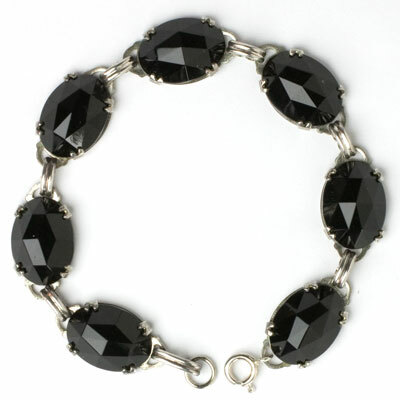 Bracelets like this one were available in many colors of glass to imitate gemstones. 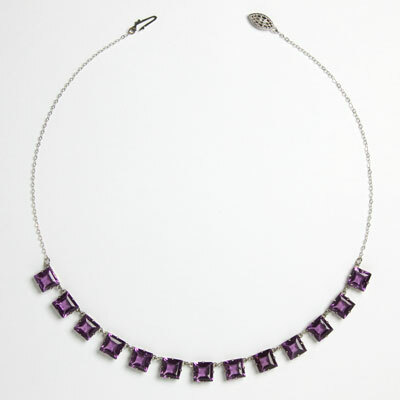 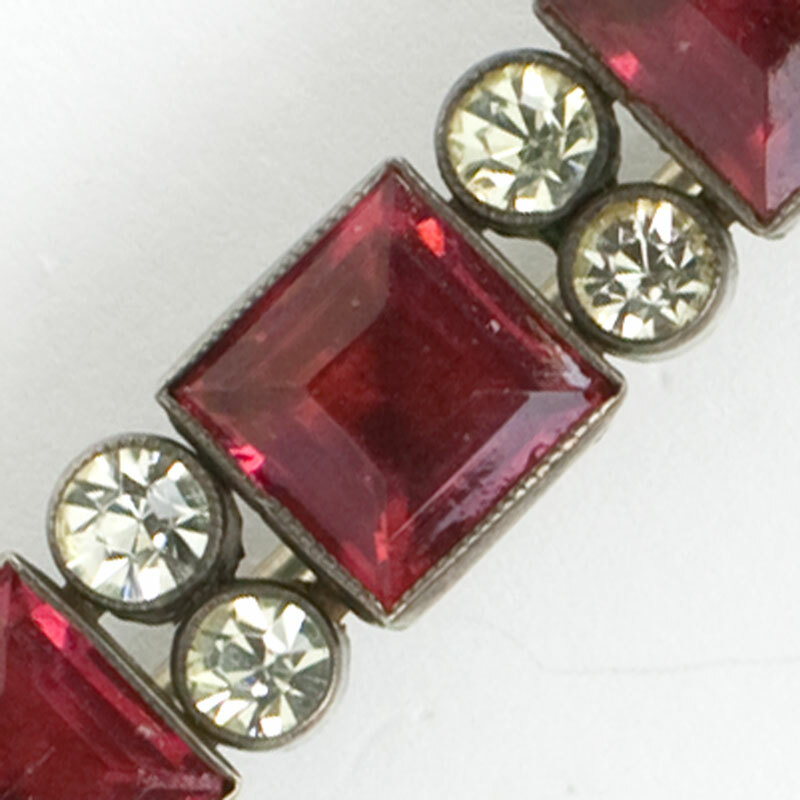 With open-back faceted, square-cut stones to let light pass through, this piece goes with everything. 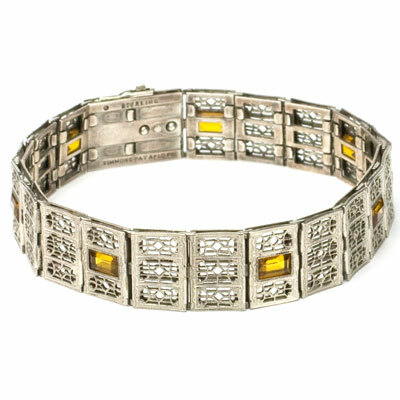 It also looks great with other bangles and/or line bracelets of the era. 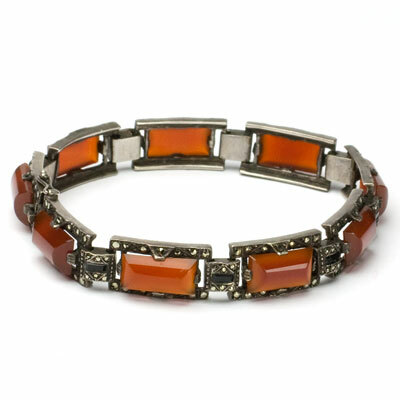 Women typically wore multiple bracelets back then, and I confess that I’ve adopted that practice as part of my own personal style. 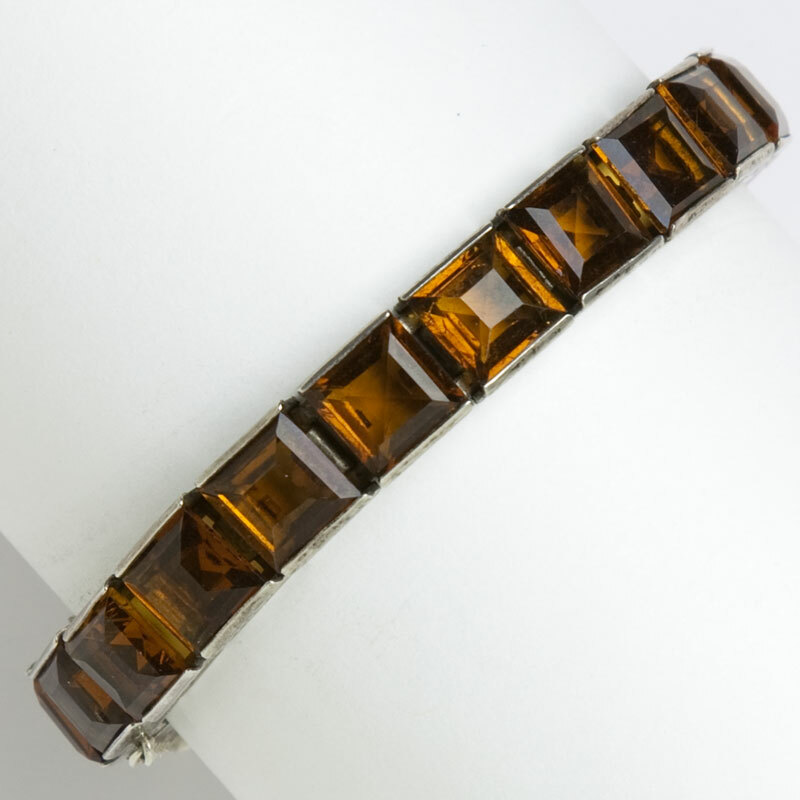 This bracelet was made for a slim wrist, so please note the inside circumference (6 3/4″) and check your wrist size before purchasing this piece. 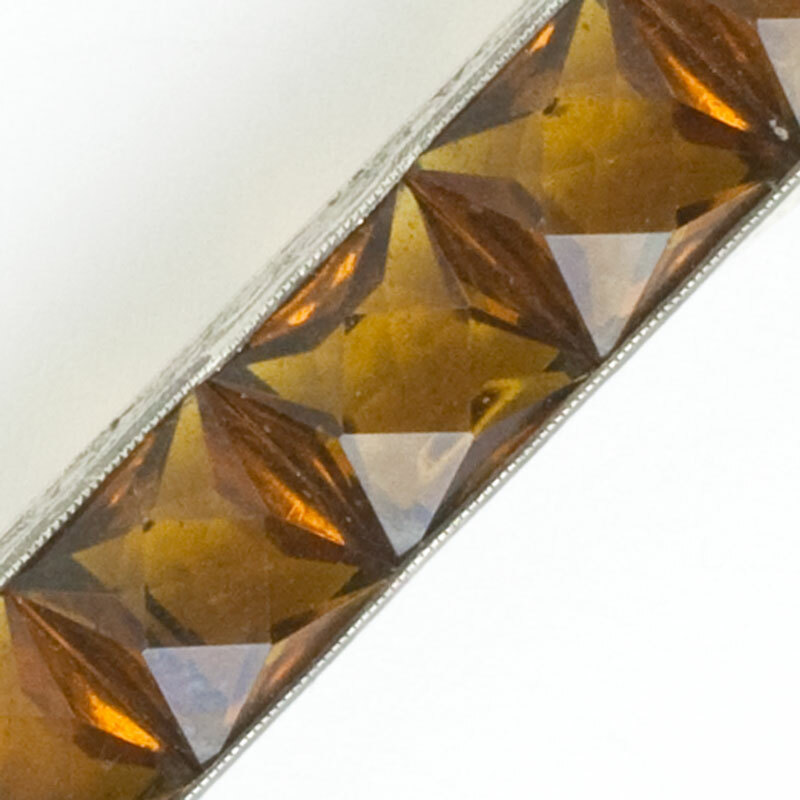 A few of the stones have tiny chips, and there's a space between the stone next to the hinge and the metal (shown in the last photo). 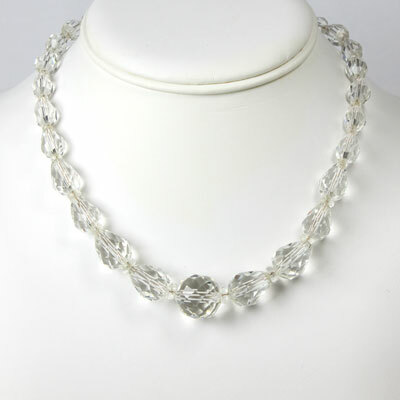 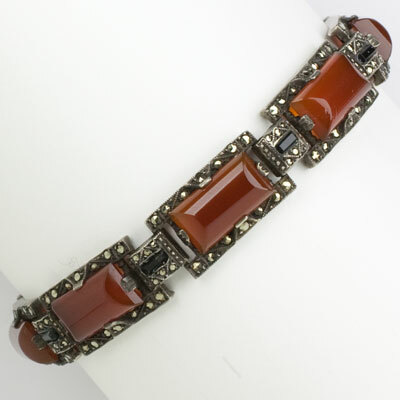 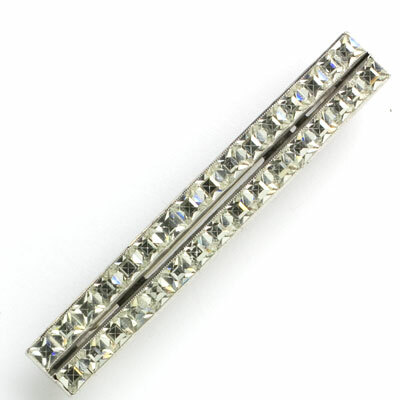 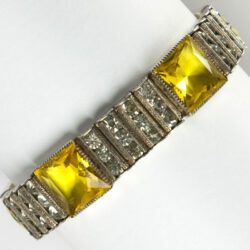 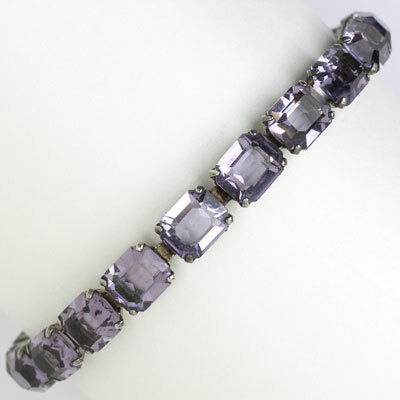 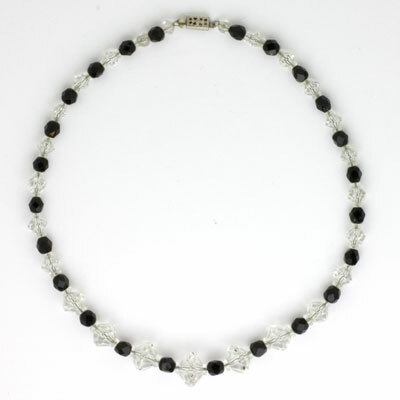 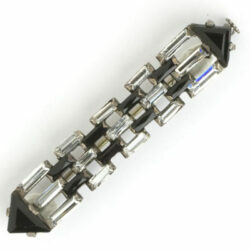 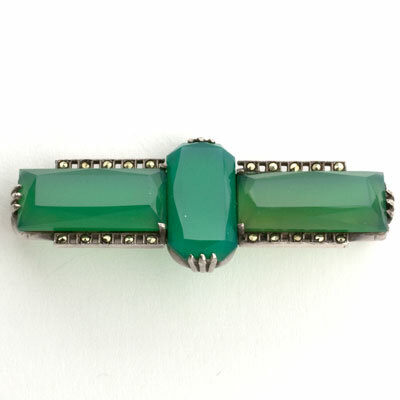 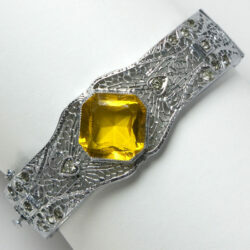 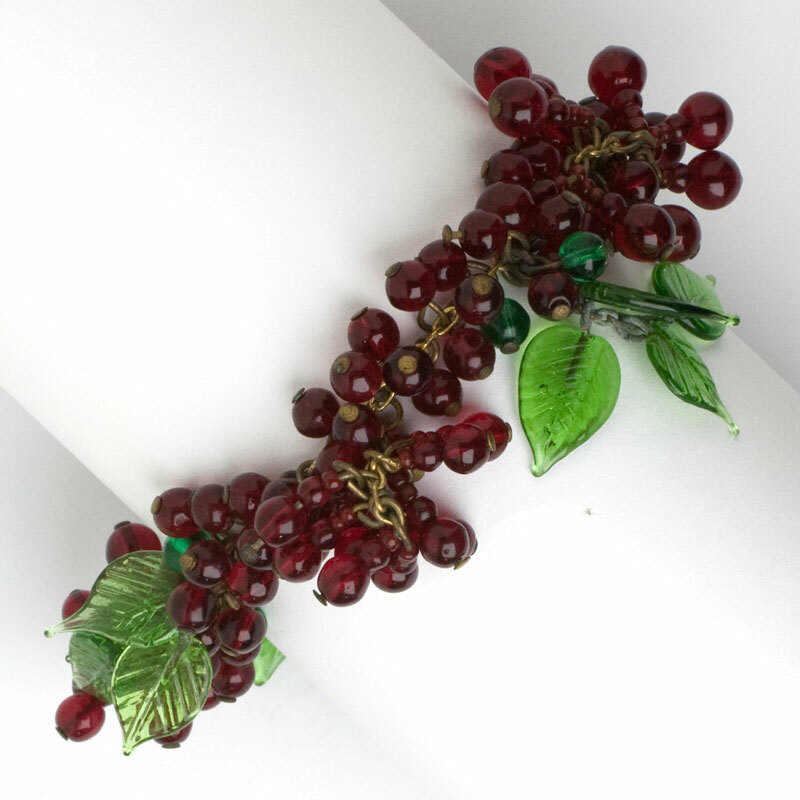 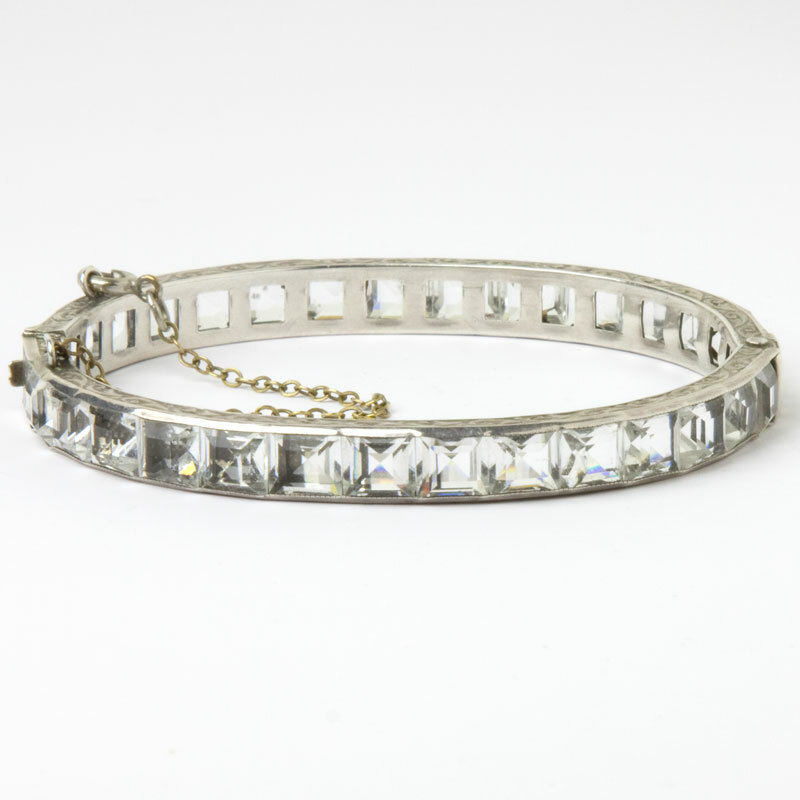 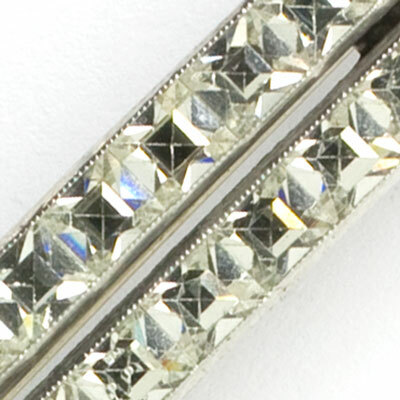 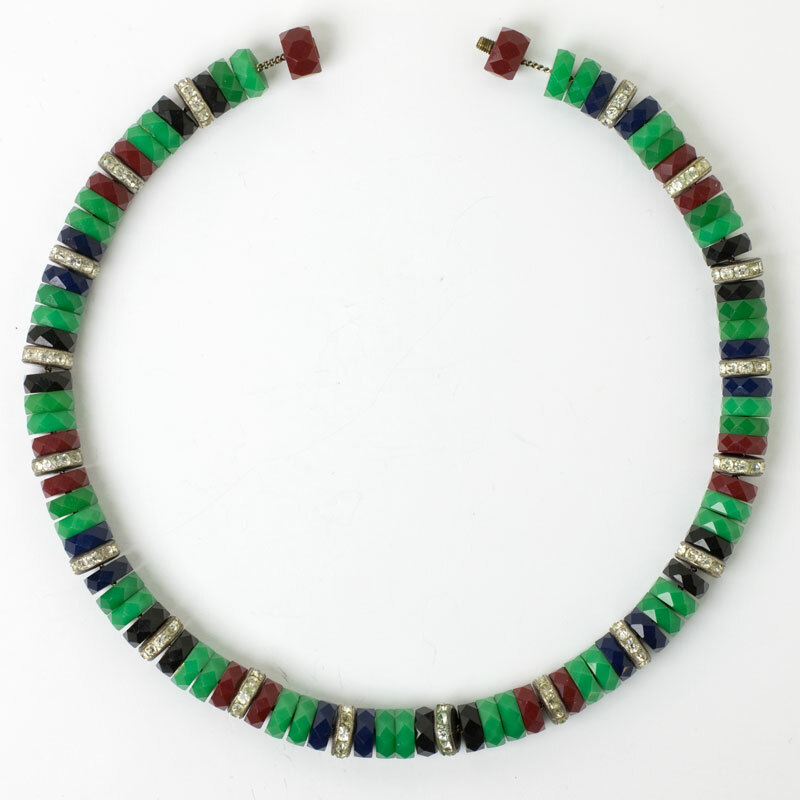 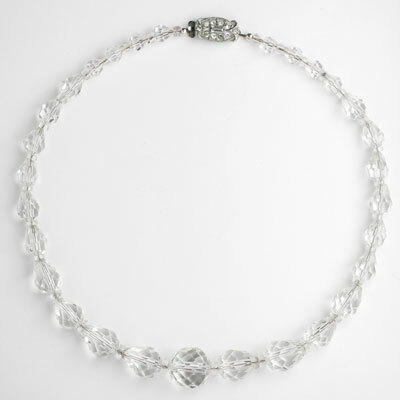 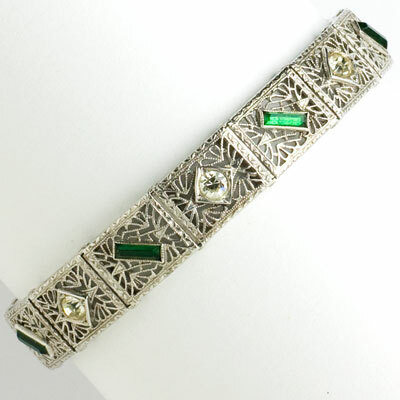 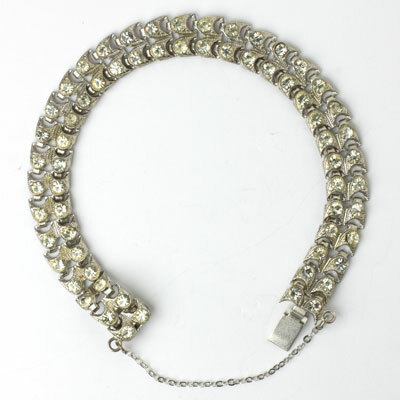 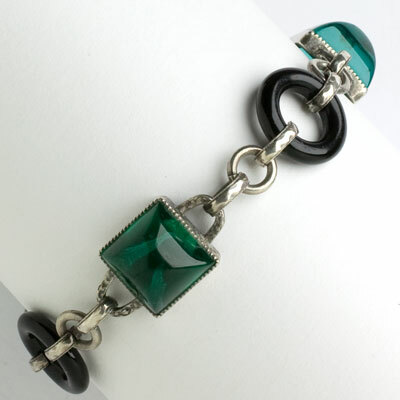 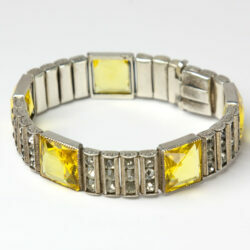 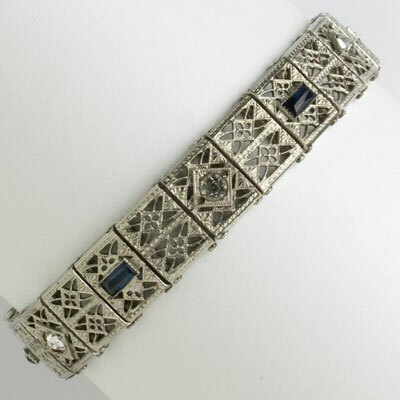 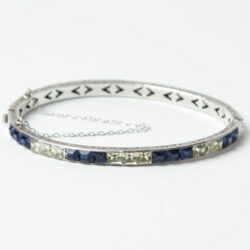 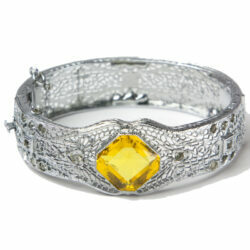 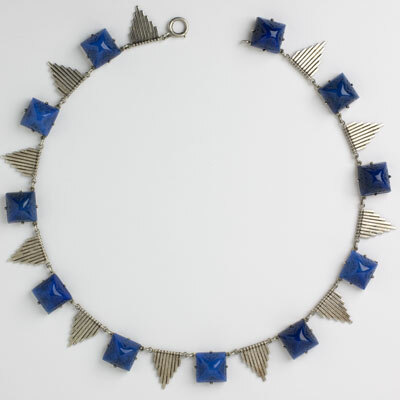 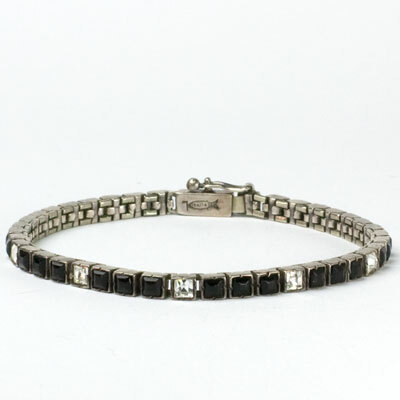 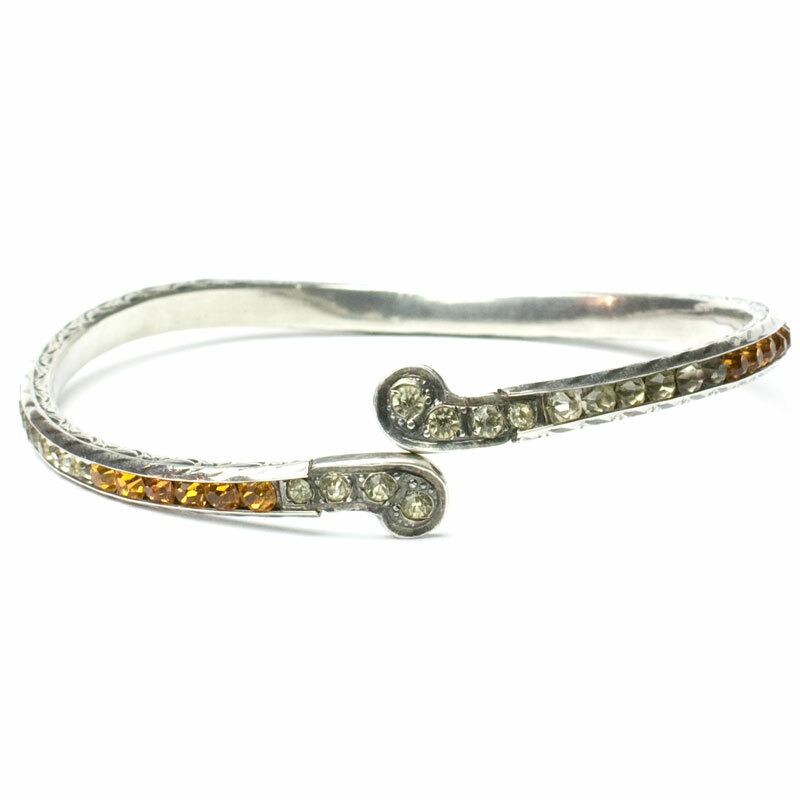 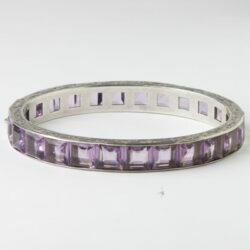 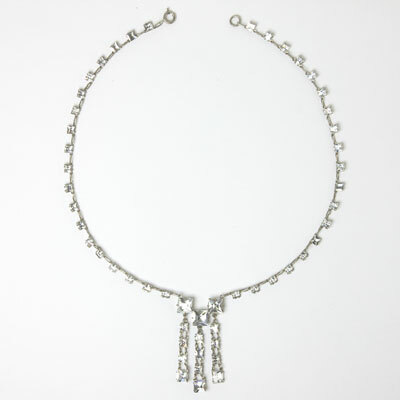 Scroll down to see other Art Deco crystal pieces to wear with this bracelet. 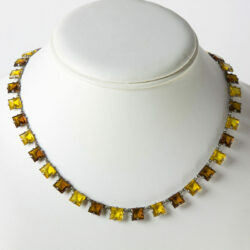 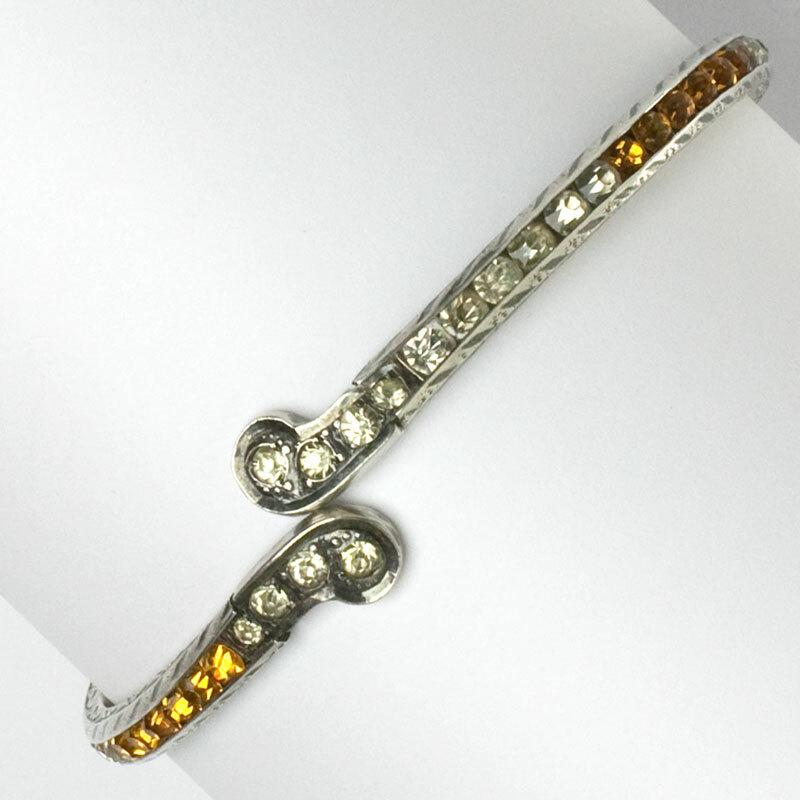 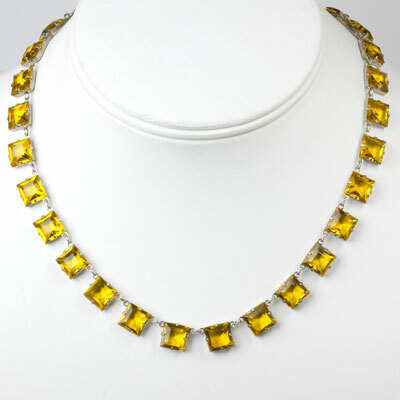 Faceted, square-cut golden-topaz (or deep-citrine) glass stones channel-set in sterling silver form this Diamonbar flexible bracelet. 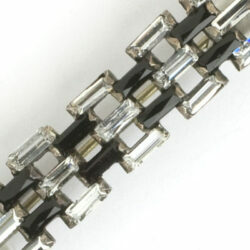 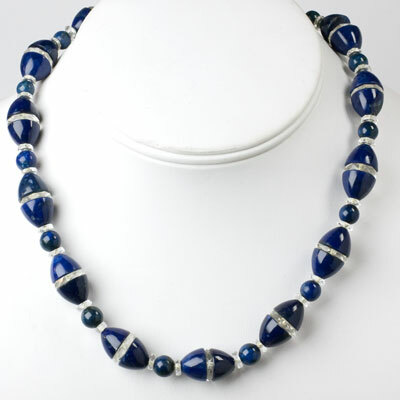 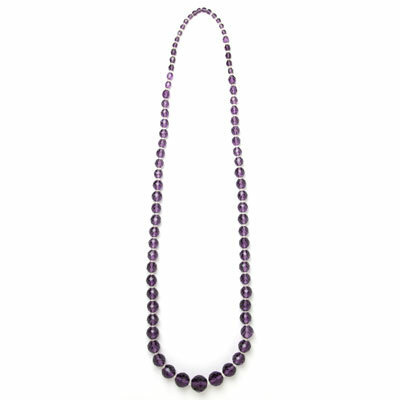 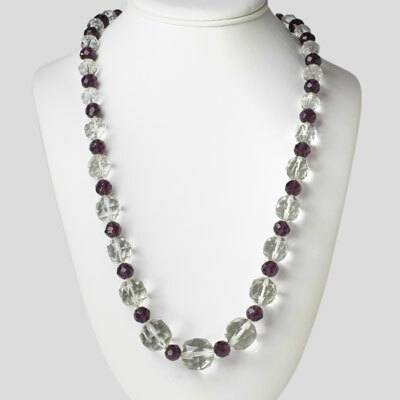 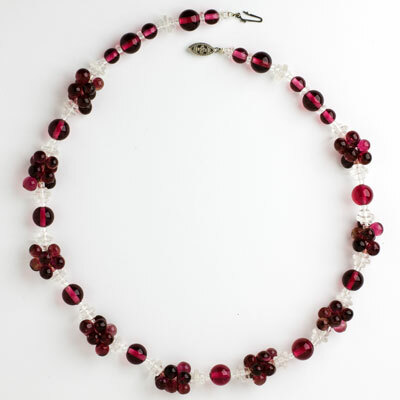 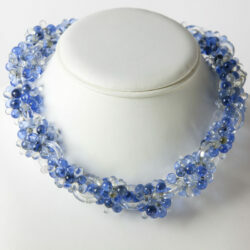 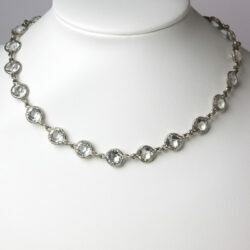 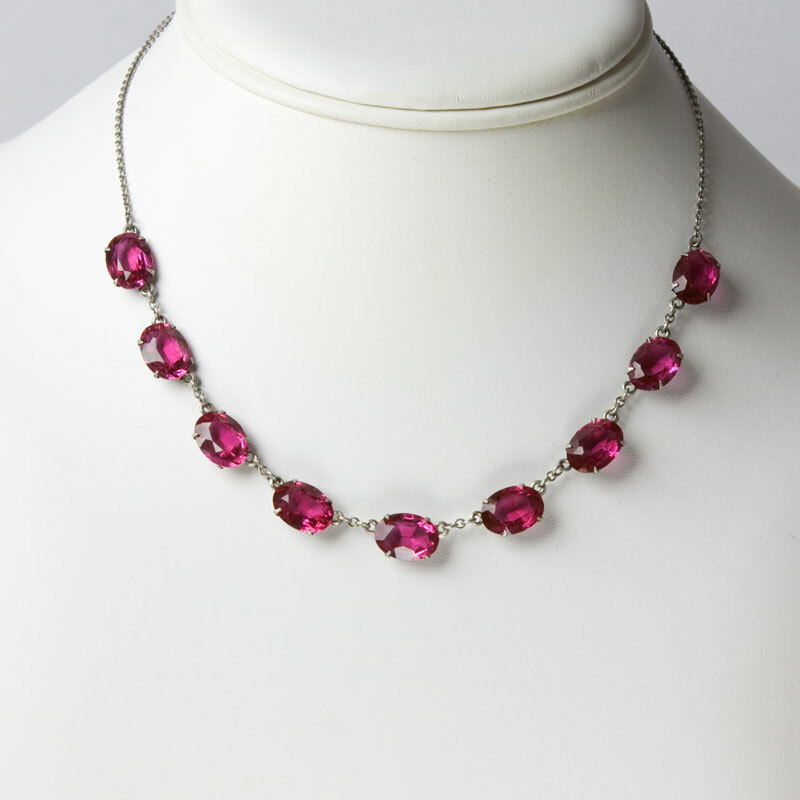 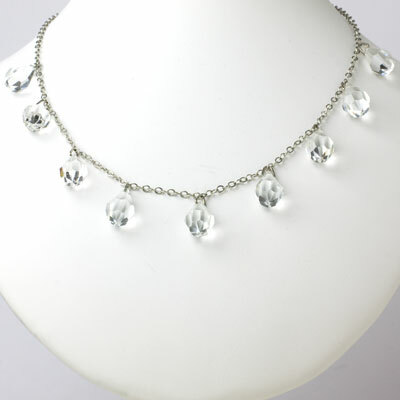 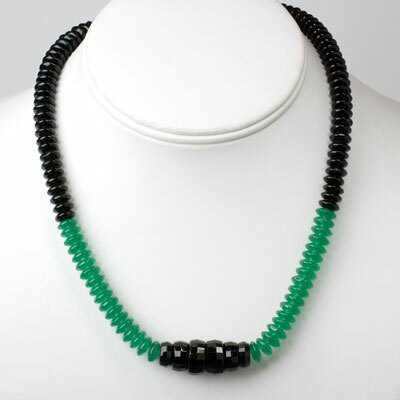 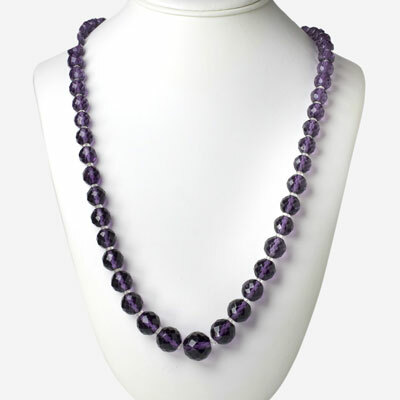 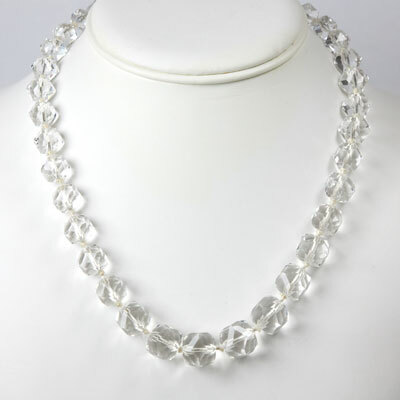 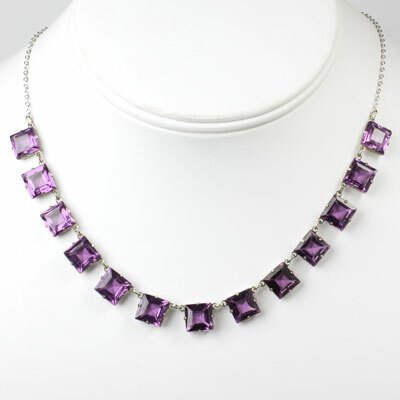 It closes with a concealed clasp and safety chain. 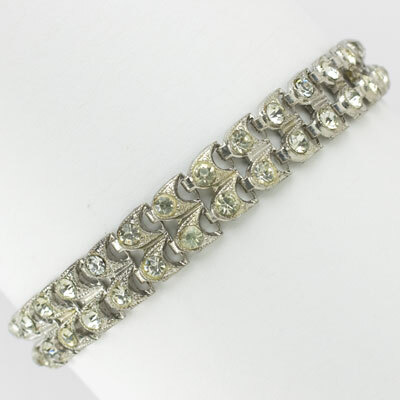 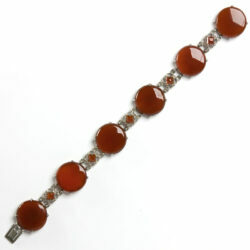 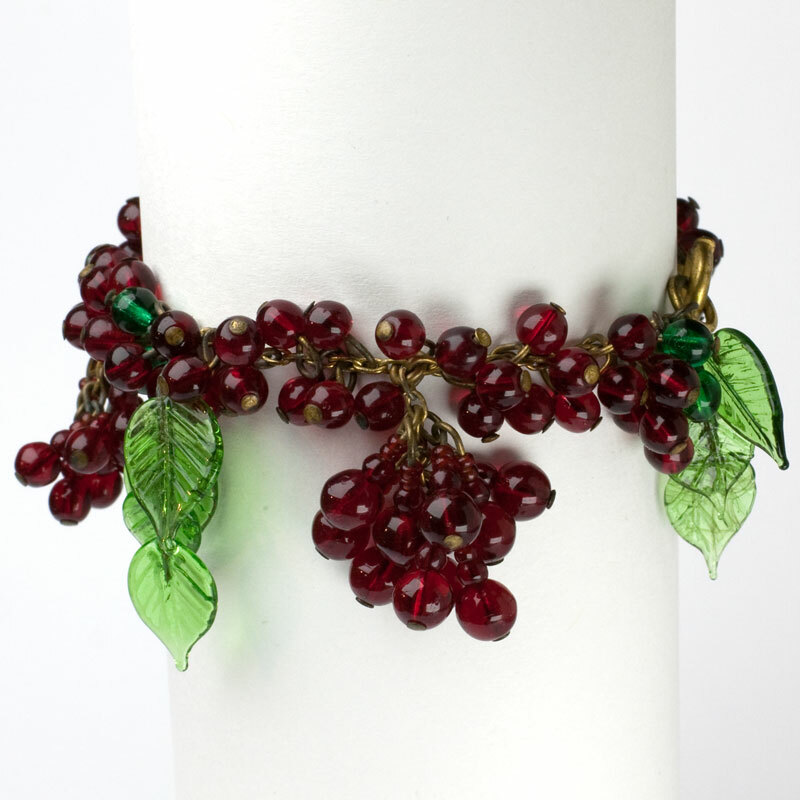 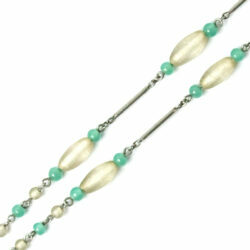 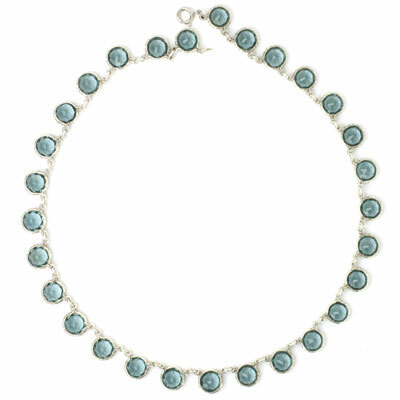 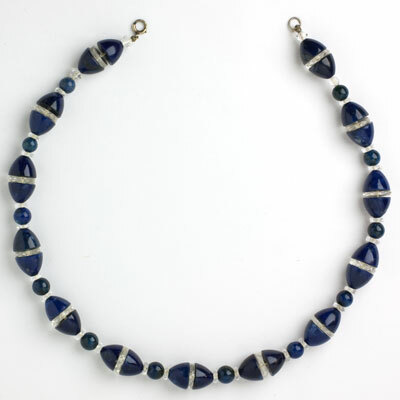 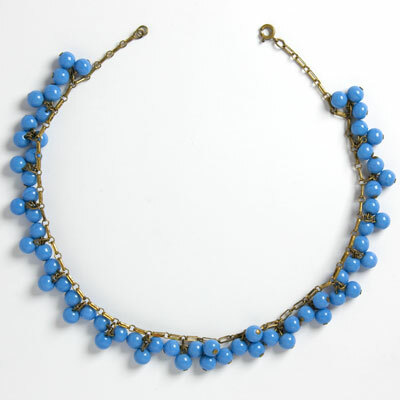 At 7 1/2" by 3/8", this bracelet is longer and wider than most made in this style in the 1920s. 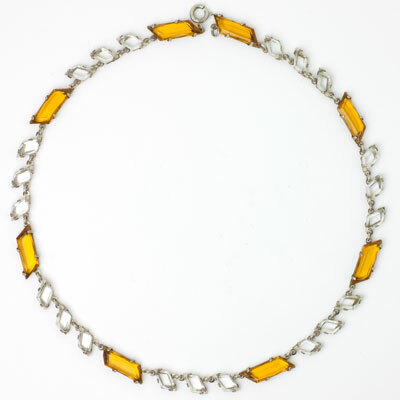 Though the patent number is not marked on the piece, its construction is in accordance with patent 1,344,365, which was issued to Harry Wachenheimer in 1920. 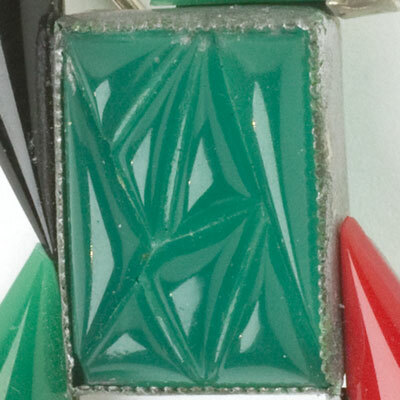 You can see the utility patent here, the second one shown below the maker's name. 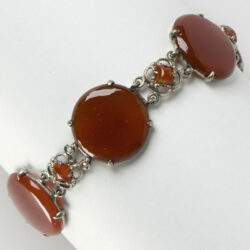 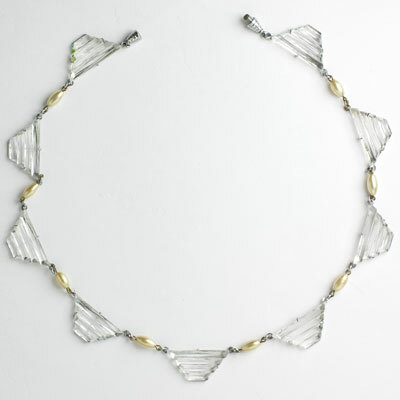 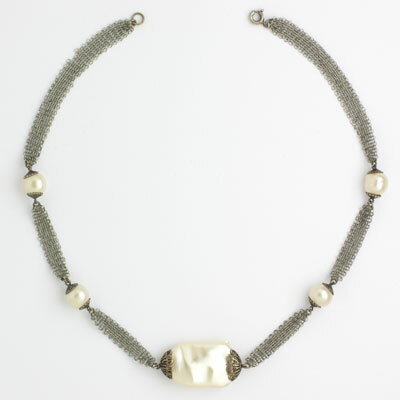 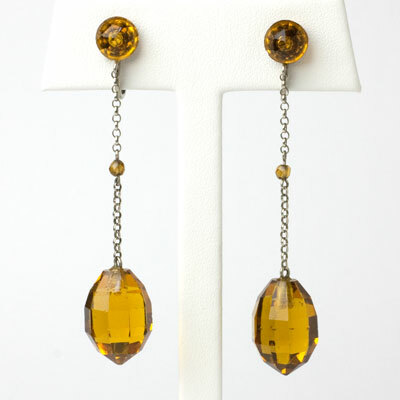 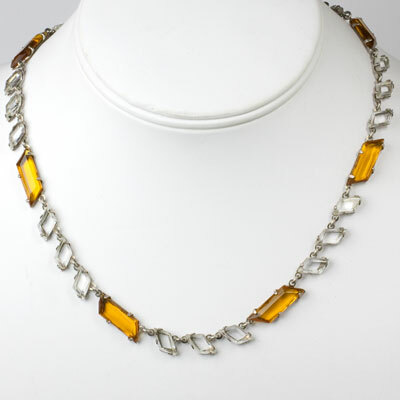 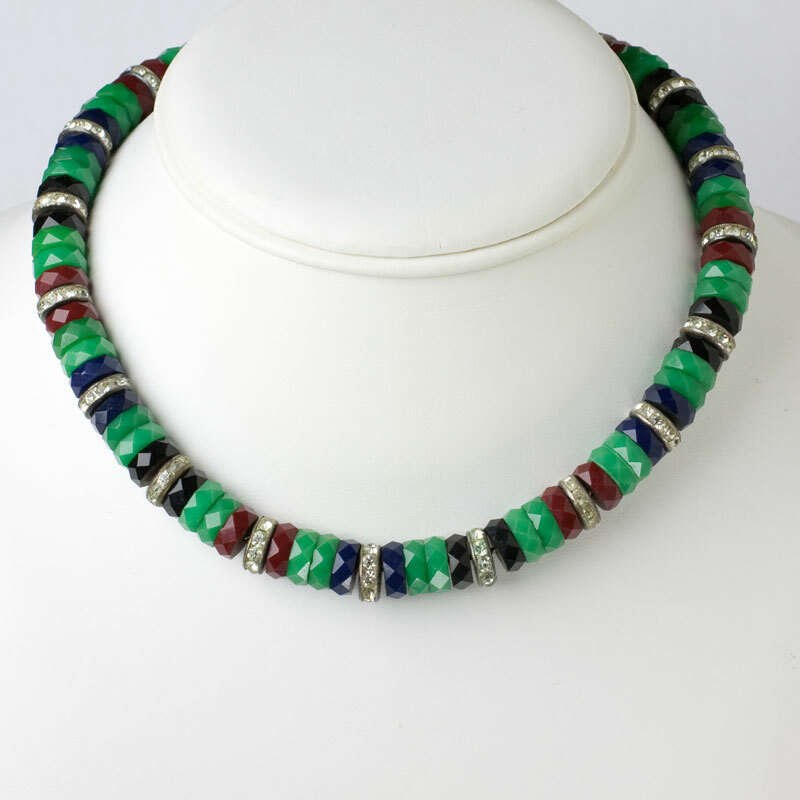 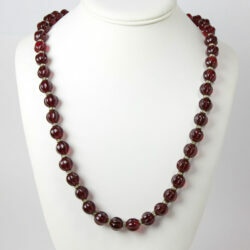 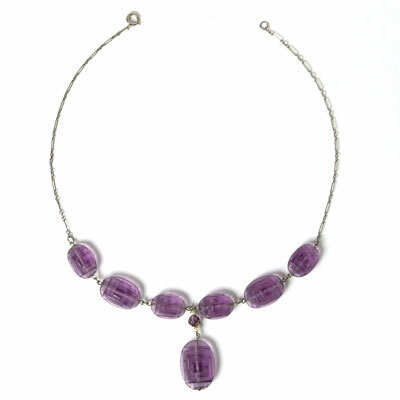 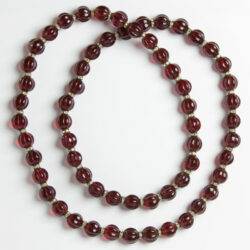 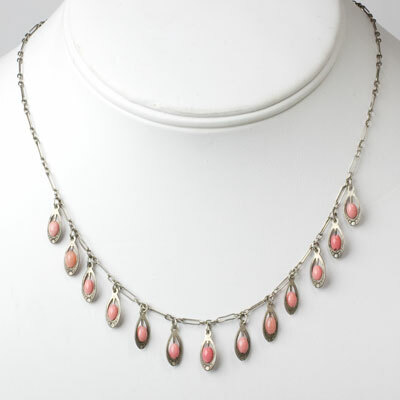 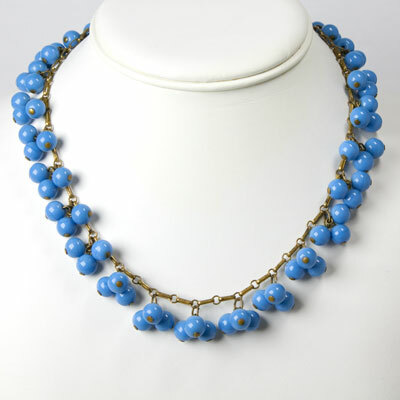 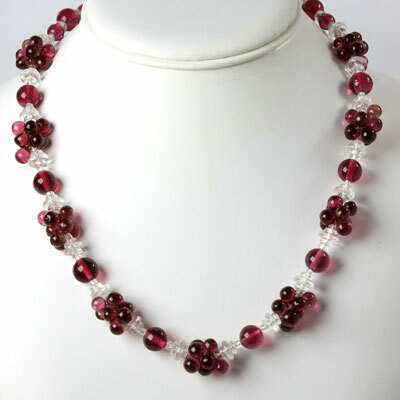 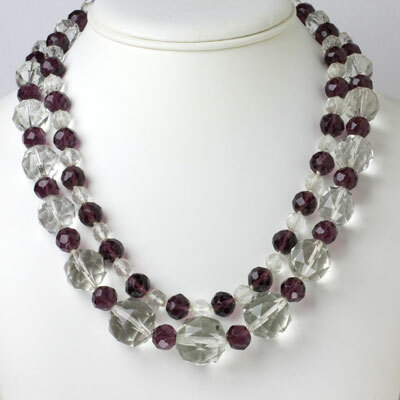 This piece was part of my personal collection and is the perfect adornment for a woman who looks best in warm colors. 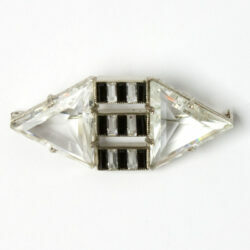 Scroll down to see a matching brooch. 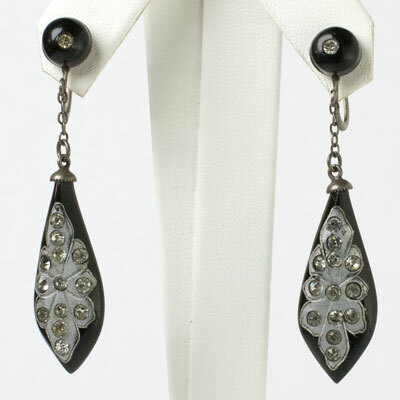 Onyx, Marcasite & Sterling Earrings by Wachenheimer Bros. 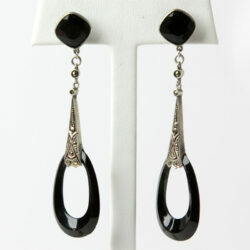 These black onyx dangle earrings in sterling silver are part of a line the maker called Wachenheimer Real Stone Jewelry. 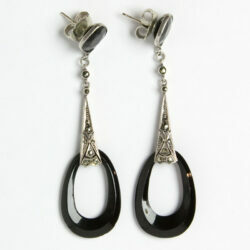 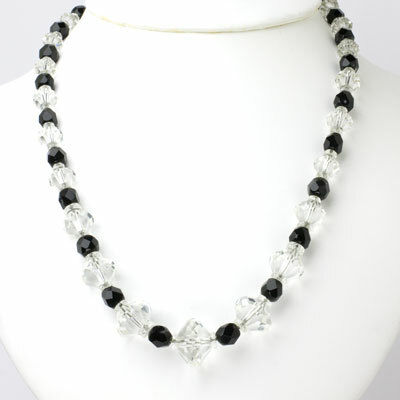 They feature a faceted, onyx (or glass?) 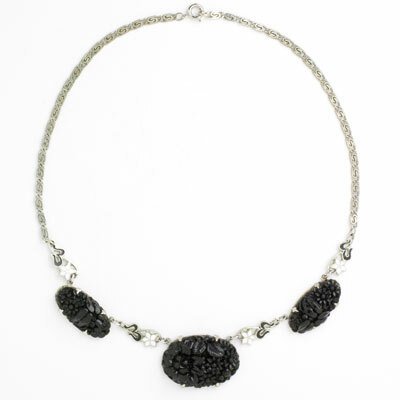 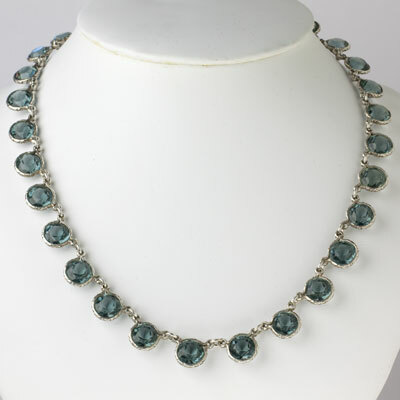 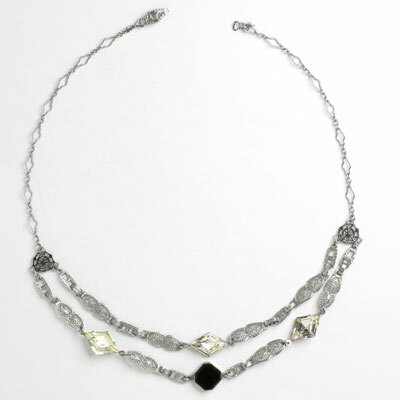 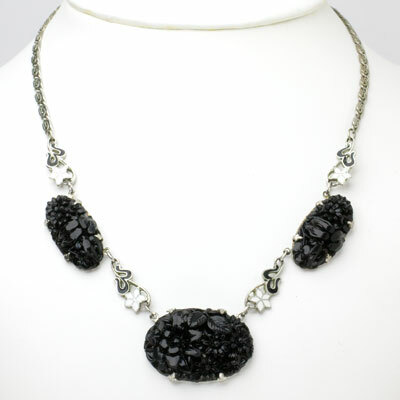 stone set with a top border of marcasites and suspended from a marcasite-encrusted slim sterling bar. 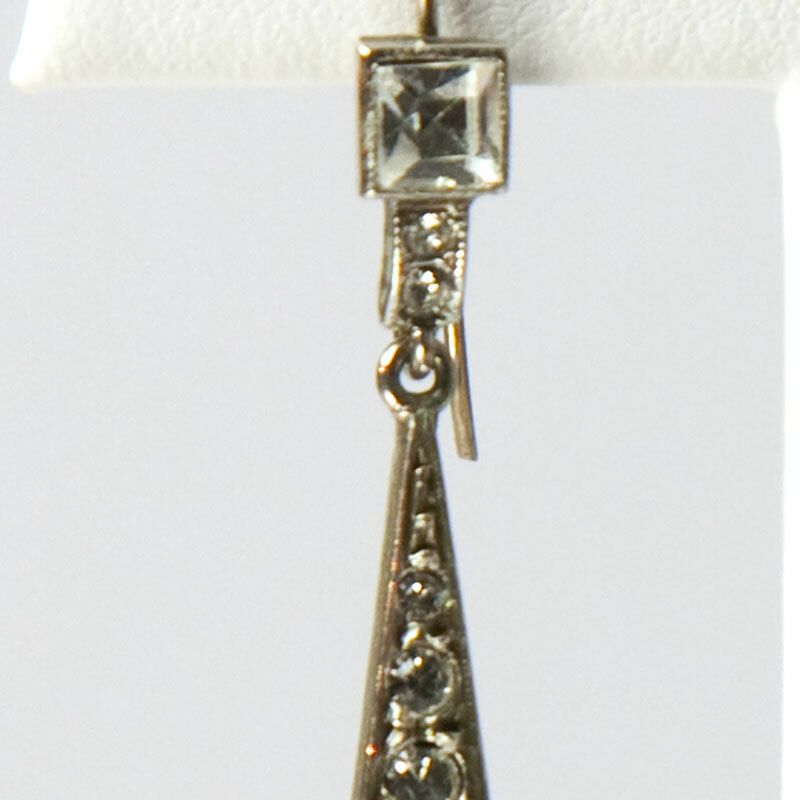 A square-cut, prong-set onyx stone sits at the earlobe. 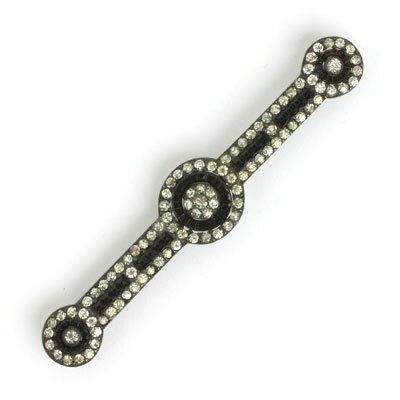 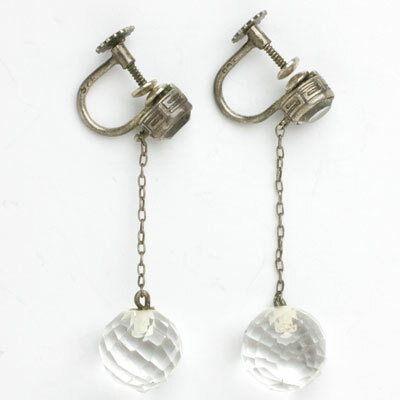 These all-original screw-back earrings can be modified for pierced ears. 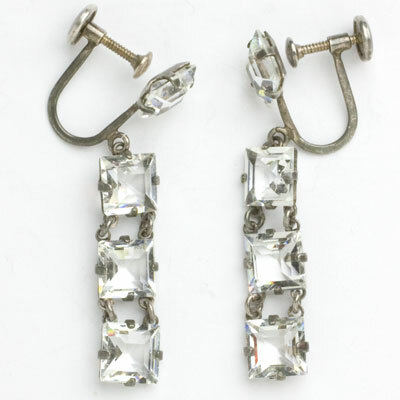 By the late 1920s, the company had moved away from their Diamonbar sterling silver flexible bracelets and bangles to this line, but the maker's high-quality is still present in these lovely earrings. 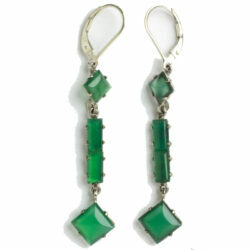 Scroll down to see a selection of onyx Art Deco pieces to wear with this versatile and stylish pair. 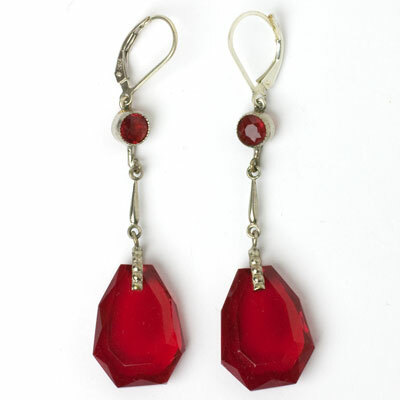 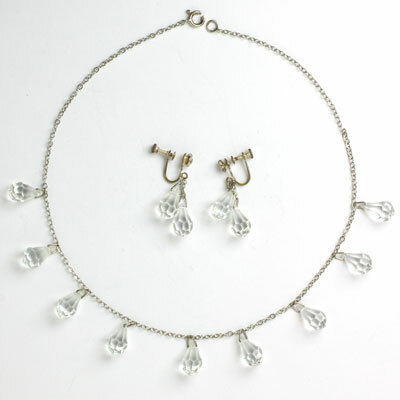 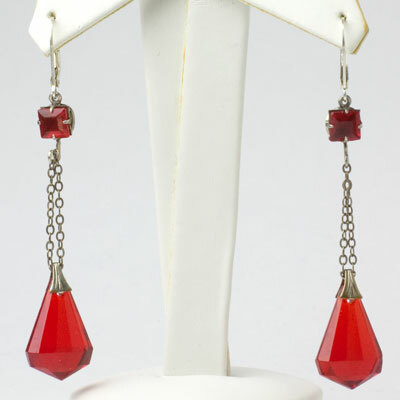 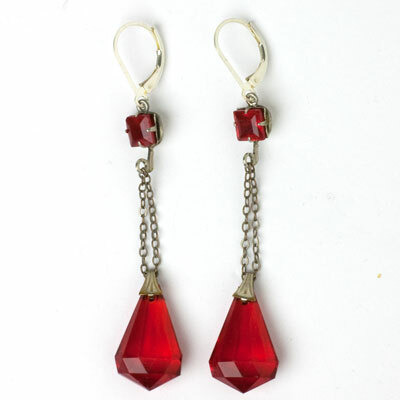 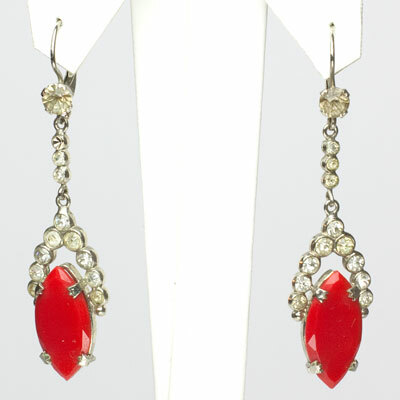 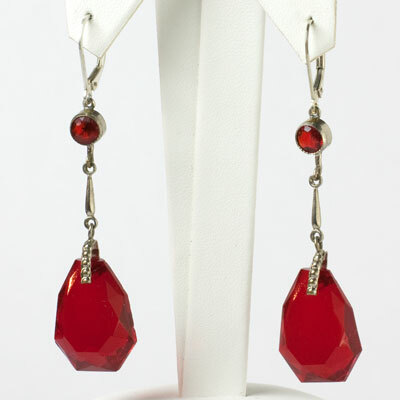 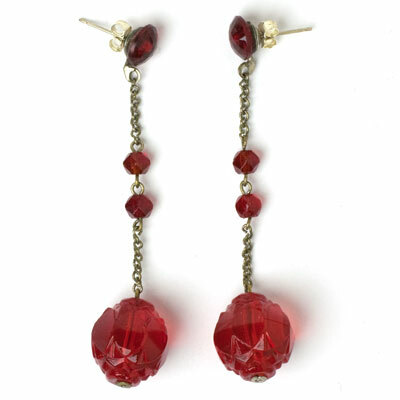 These deliciously-long (3 1/4") and fun 1920s chandelier earrings have three chains adorned with red-glass beads. 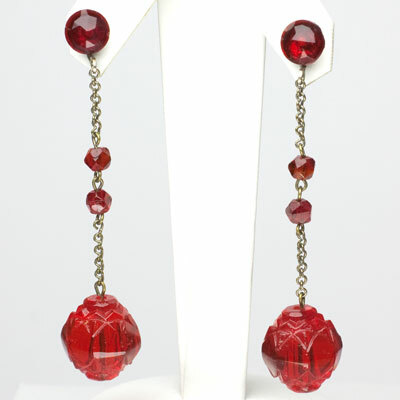 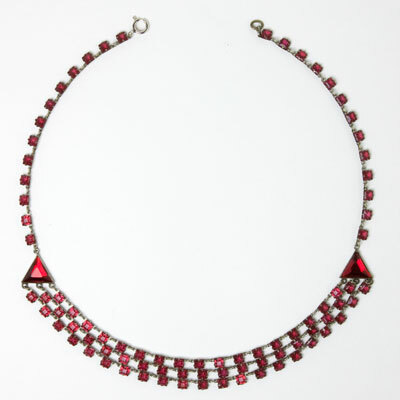 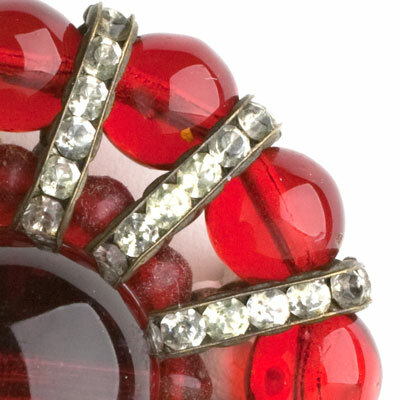 The red glass stone set at the earlobe and all but the bottom row of beads are faceted; the bottom ones are round balls. 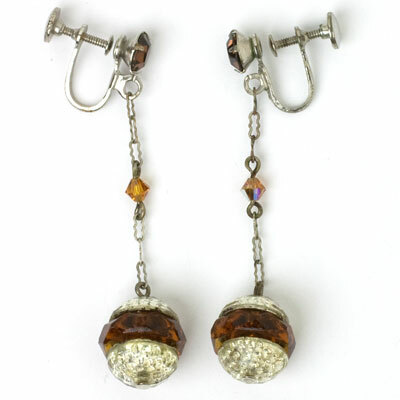 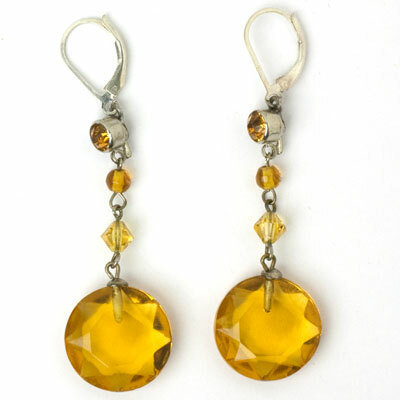 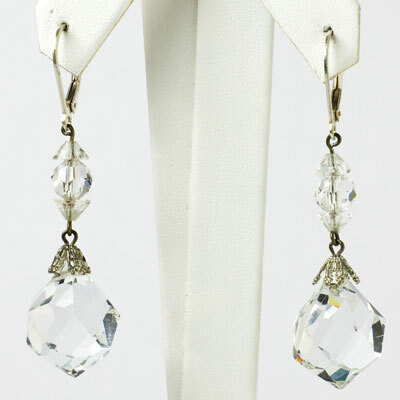 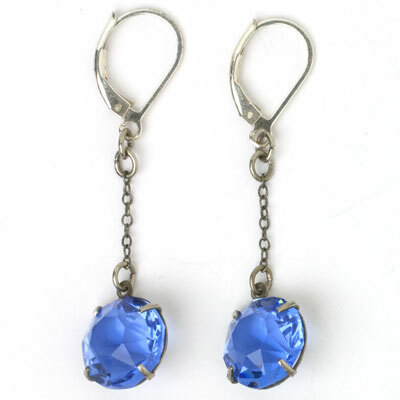 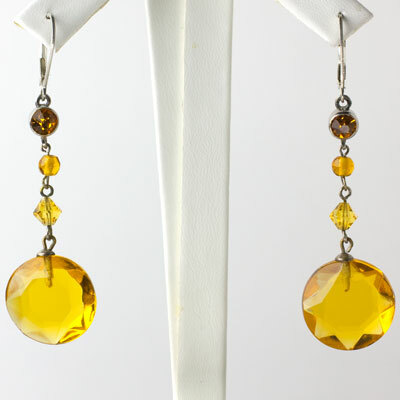 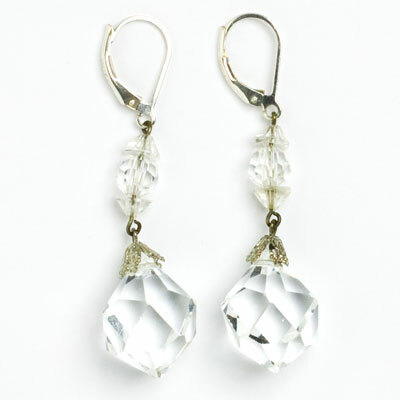 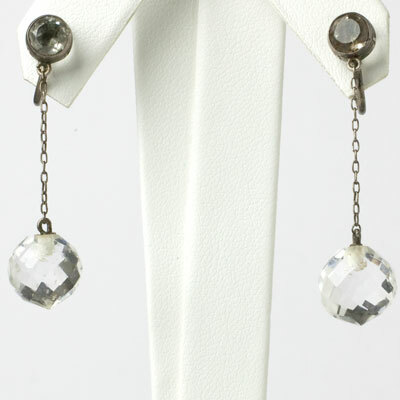 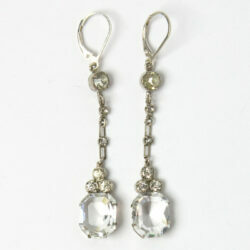 These all-original earrings have screw-backs which can be modified for pierced ears. 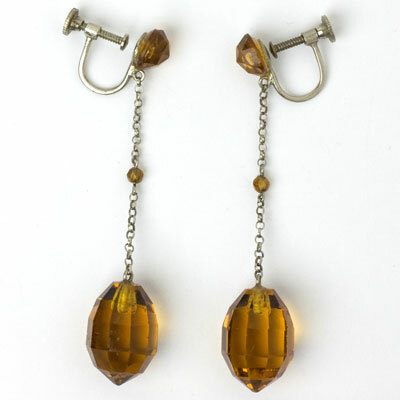 Some of the beads have minor flaws, but none is visible when this pair is worn. 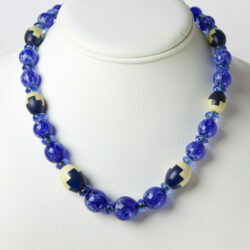 Lots of movement here! 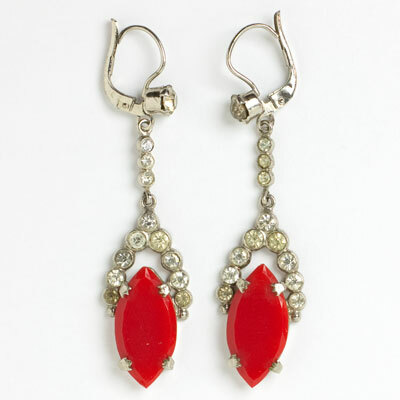 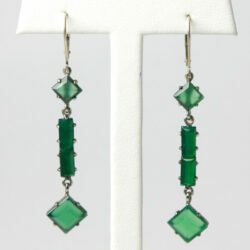 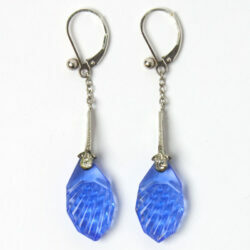 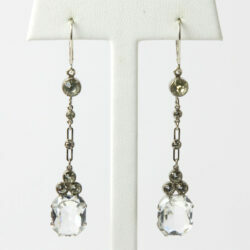 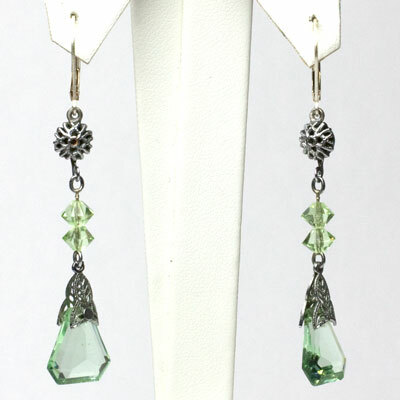 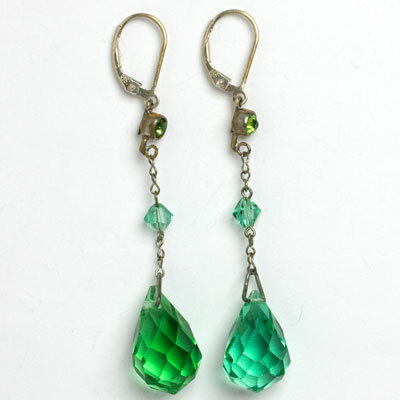 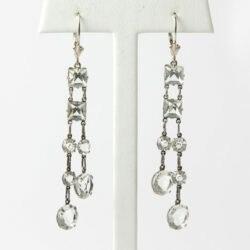 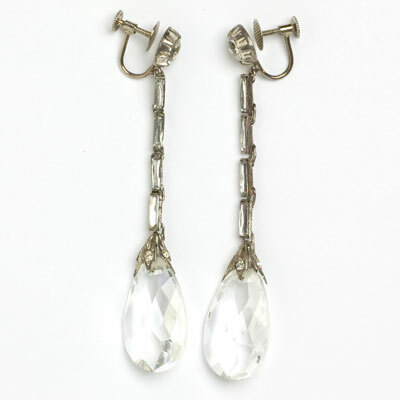 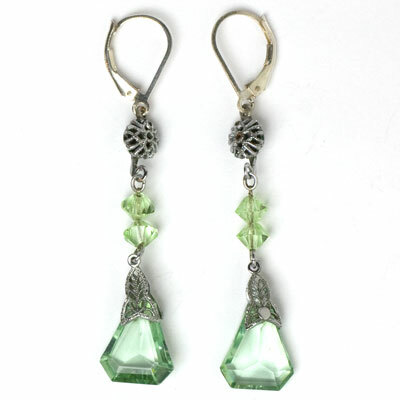 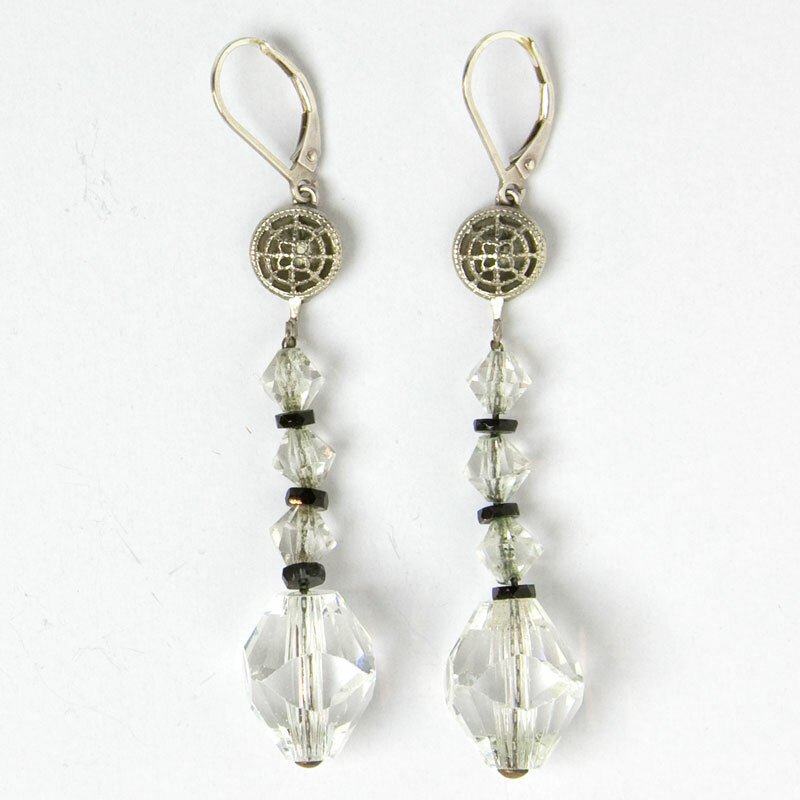 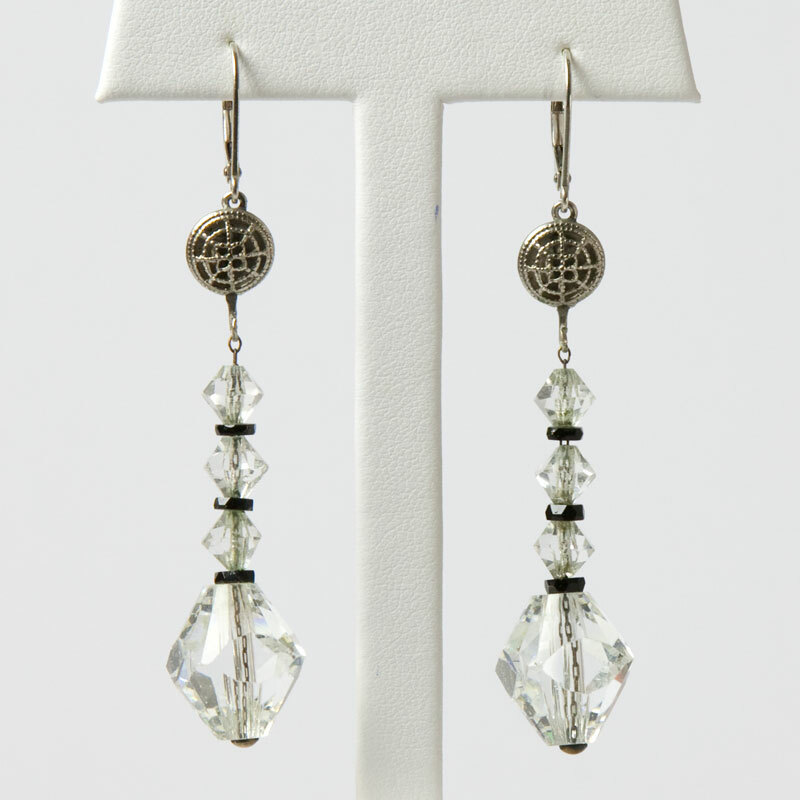 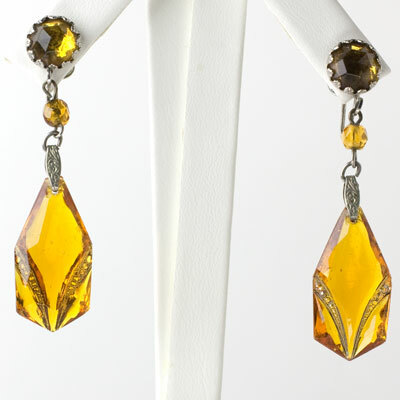 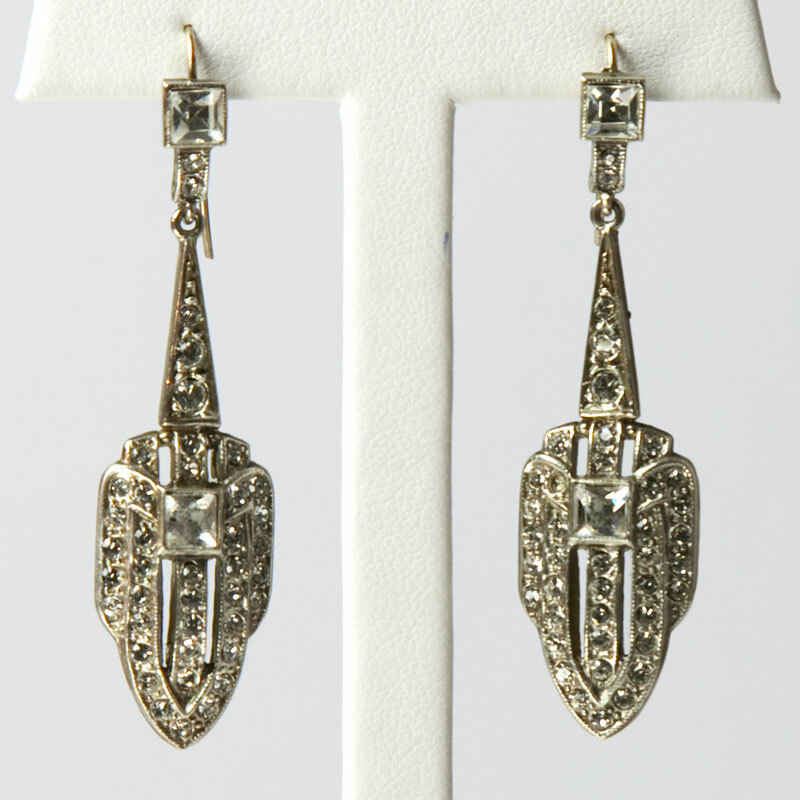 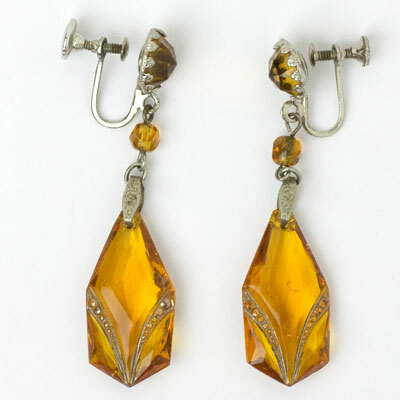 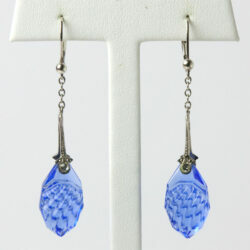 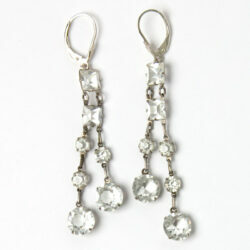 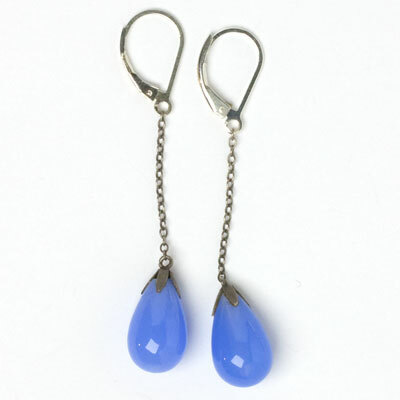 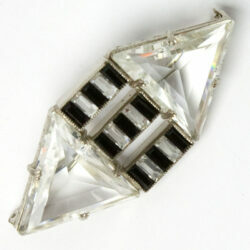 These Art Deco Czech earrings are fun! 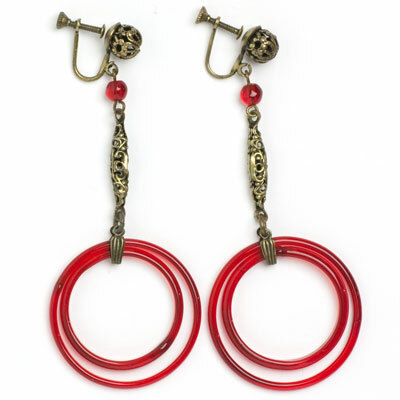 They have two red-glass hoops dangling from long brass filigree findings. 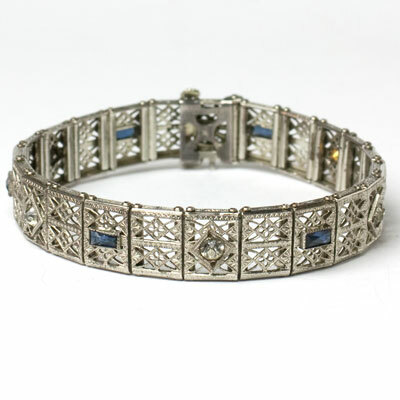 This type of filigree was used extensively by Czech makers during the 1920s. 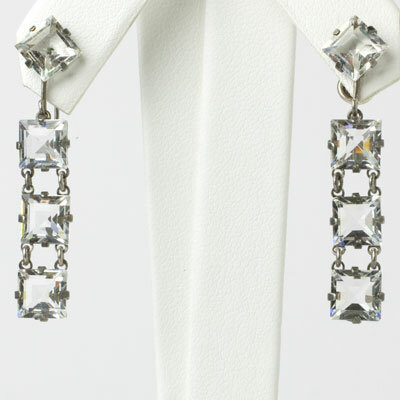 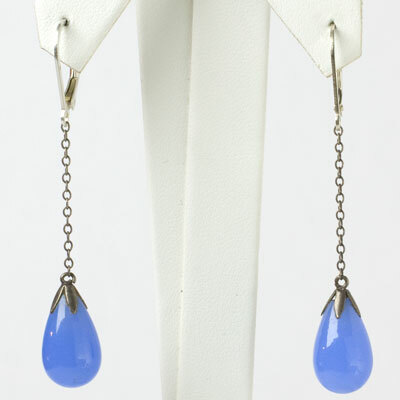 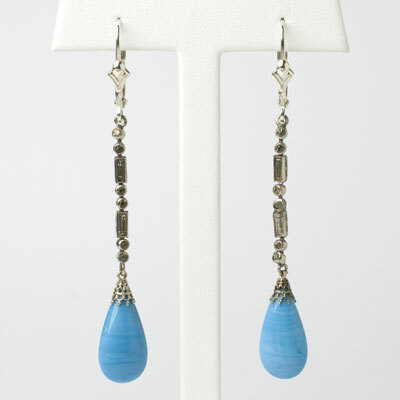 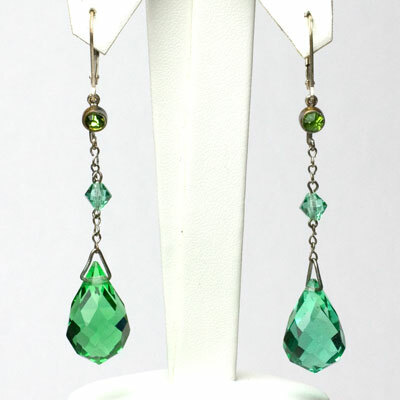 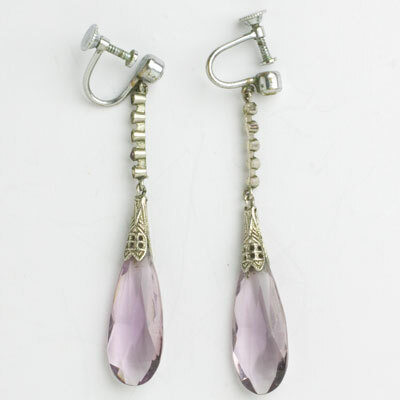 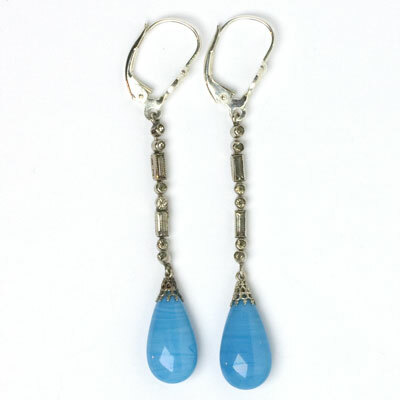 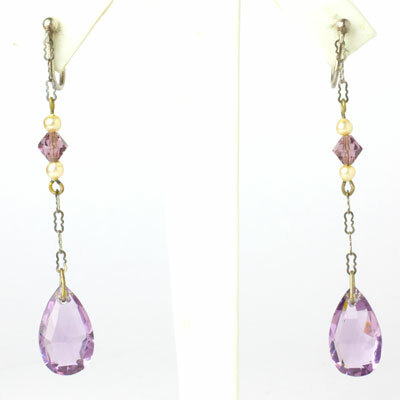 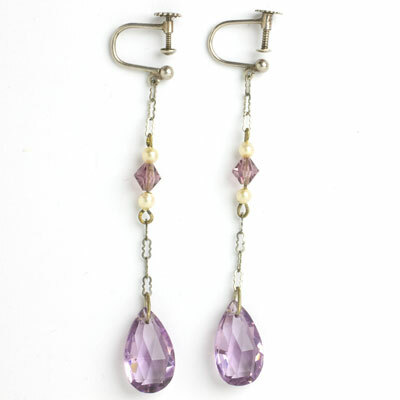 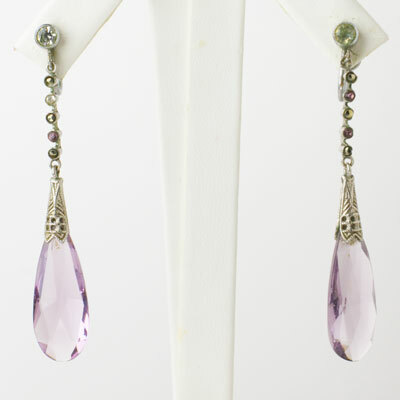 These unusually long (3″), all-original earrings have screw-backs and lots of movement. 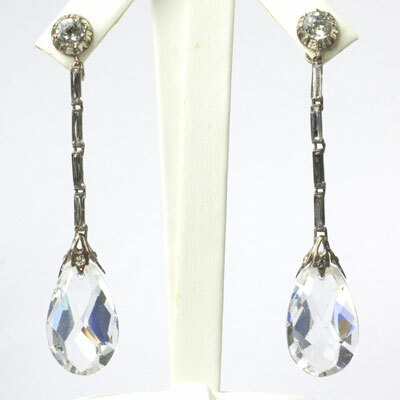 These earrings can be modified for pierced ears. 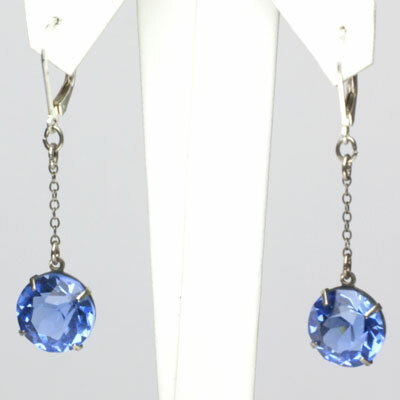 Wear them with distinction for off-duty activities and business-casual days.